You are currently browsing the tag archive for the ‘Mario Zeffiri’ tag. 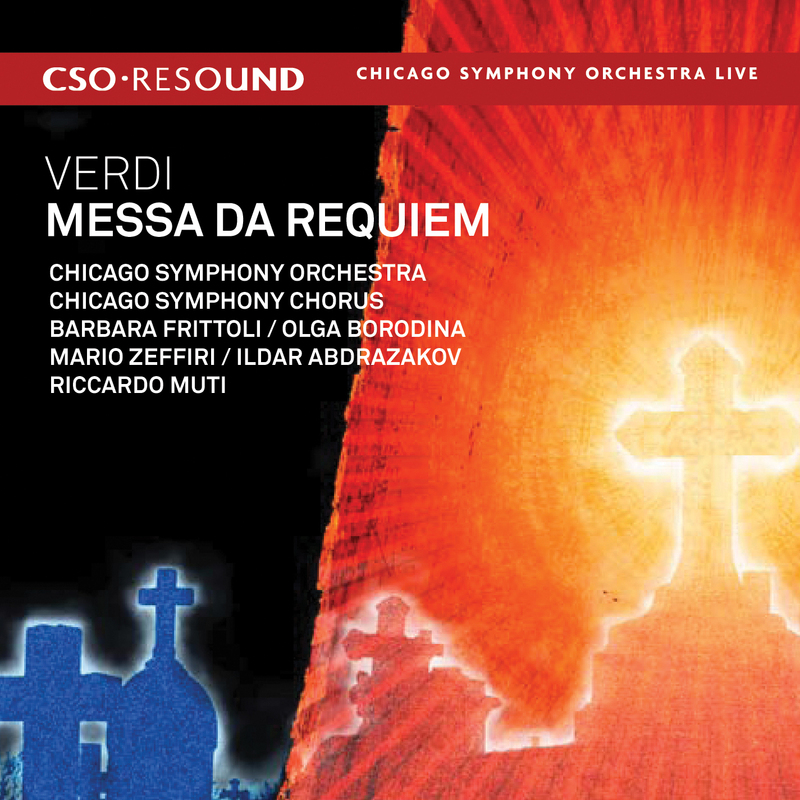 To celebrate Giuseppe Verdi’s 200th birthday on October 10, 2013, Riccardo Muti led the Chicago Symphony Orchestra and Chorus (prepared by Duain Wolfe)—along with soloists Tatiana Serjan, Daniela Barcellona, Mario Zeffiri, and Ildar Abdrazakov—in Verdi’s Requiem at Orchestra Hall. 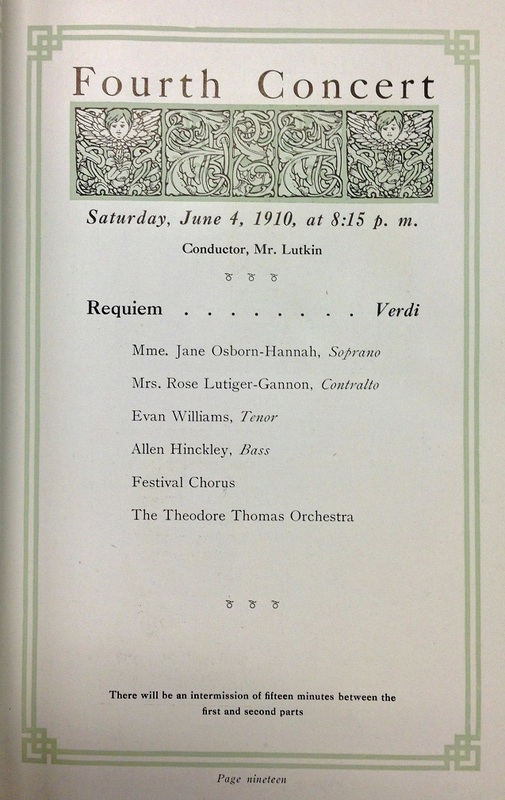 The concert capped off a celebration that was comprised of several performances of Verdi’s music, including concert performances of his opera Macbeth. 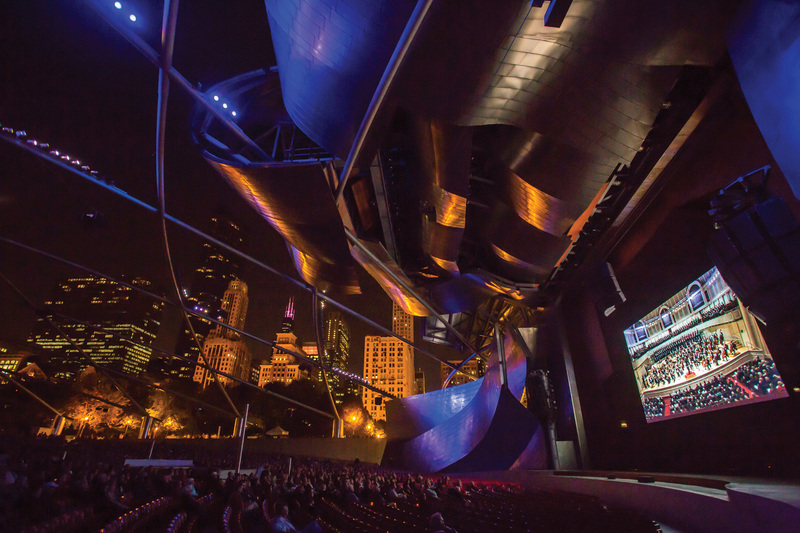 The video of the Requiem was projected into Millennium Park’s Pritzker Pavilion and Benito Juarez Community Academy in Chicago, as well as streamed live across the Internet via numerous collaborating websites and the Orchestra’s Facebook page. 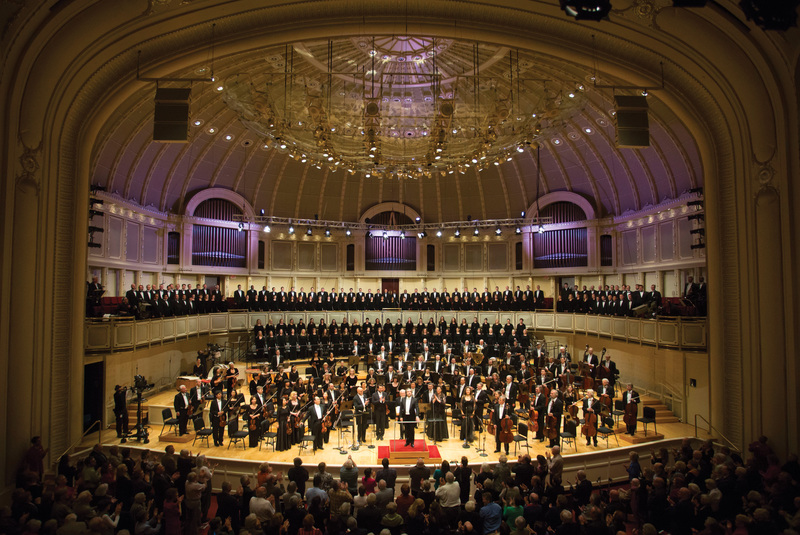 The following year, to open the 124th season on September 18, 2014, Riccardo Muti led the Orchestra, Chorus, and soloists Camilla Nylund, Ekaterina Gubanova, Matthew Polenzani, and Eric Owens in Beethoven’s Ninth Symphony at Orchestra Hall. Also video recorded, the performance was made available for free streaming on the Orchestra’s website. This article also appears here. Videos of Verdi’s Requiem and Beethoven’s Ninth Symphony are available here and here. On May 5, 2008, Chicago Symphony Orchestra Association president Deborah Rutter Card announced that Riccardo Muti would become the Orchestra’s tenth music director, beginning with the 2010–11 season. 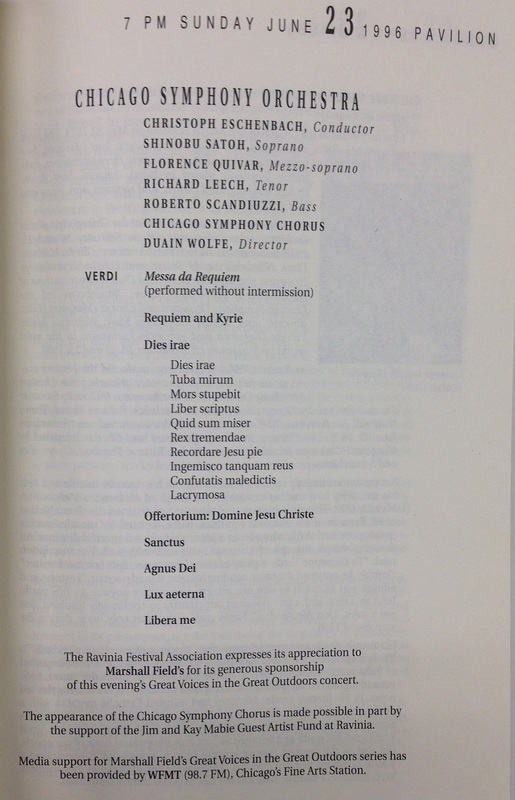 Muti’s first appearances as music director designate were on January 15, 16, and 17, 2009, in Verdi’s Requiem. 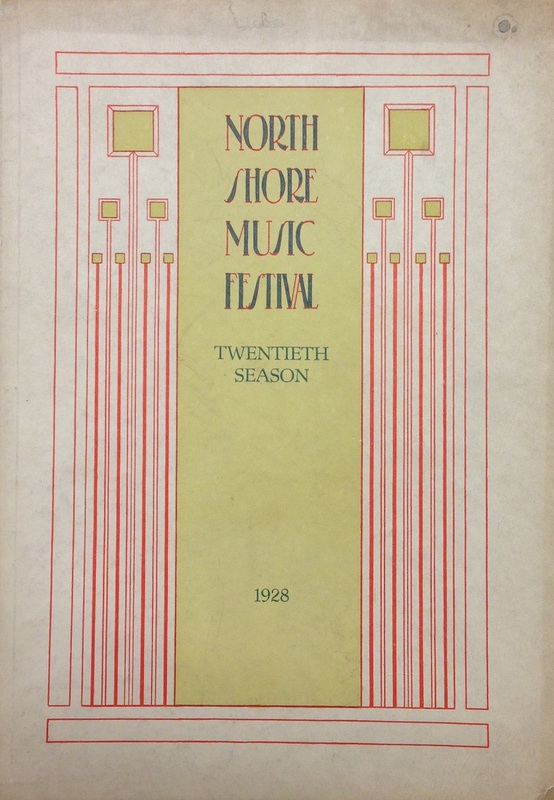 Soloists were Barbara Frittoli, Olga Borodina, Mario Zeffiri, and Ildar Abdrazakov, and the Chicago Symphony Chorus was prepared by chorus director Duain Wolfe. On February 13, 2011, the recording received Grammy awards for Best Classical Album and Best Choral Performance from the National Academy of Recording Arts and Sciences. 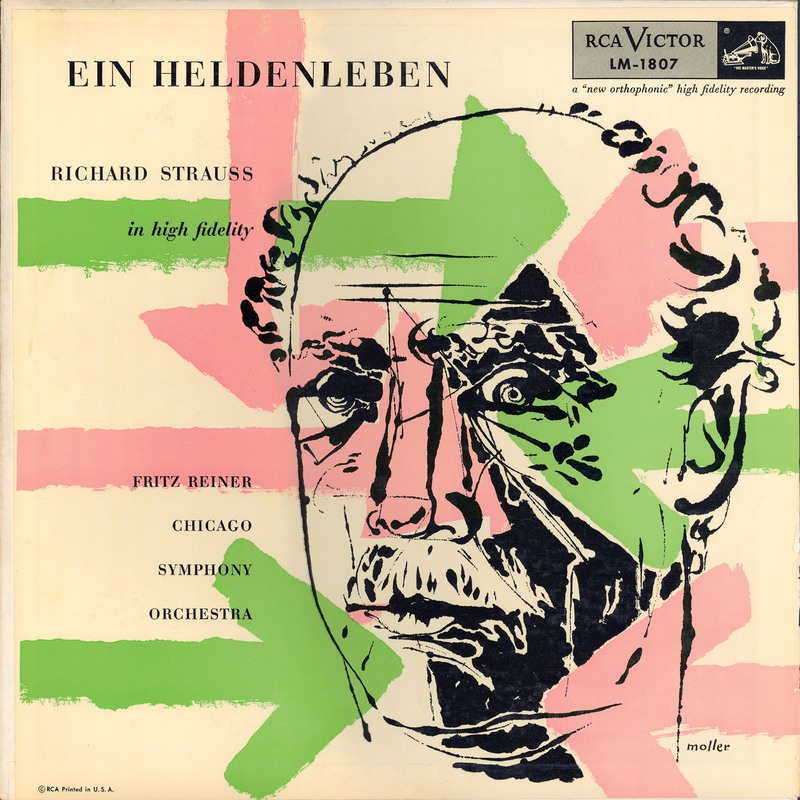 The commercial recording legacy of the Chicago Symphony Orchestra—under second music director Frederick Stock—began on May 1, 1916. 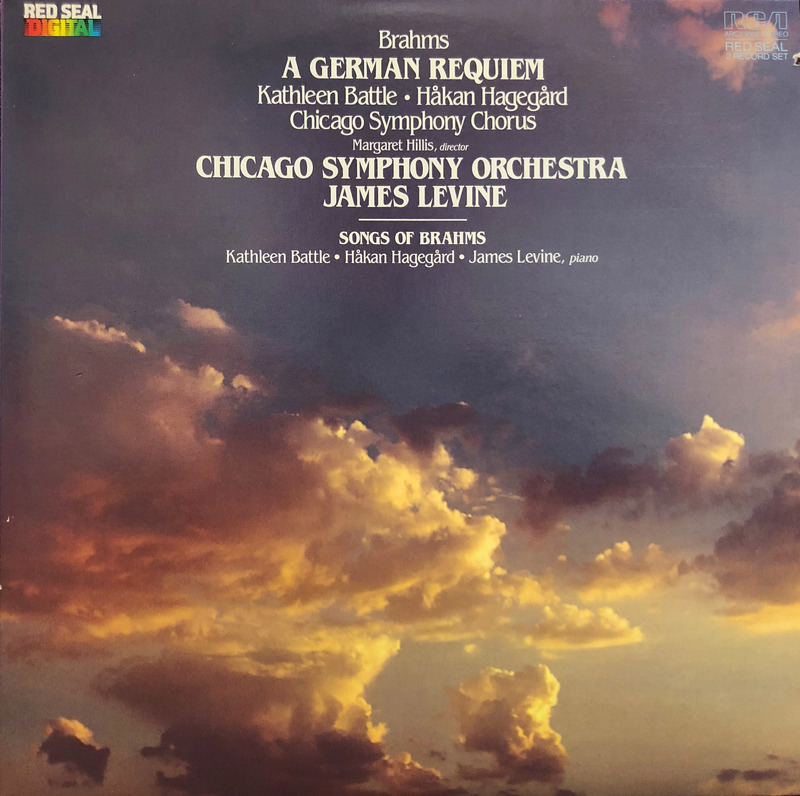 For the Columbia Graphophone Company (at an undocumented location in Chicago), they recorded Mendelssohn’s Wedding March from A Midsummer Night’s Dream; Wagner’s Ride of the Valkyries from Die Walküre; and Grieg’s Two Elegiac Melodies, Heart Wounds and The Last Spring. 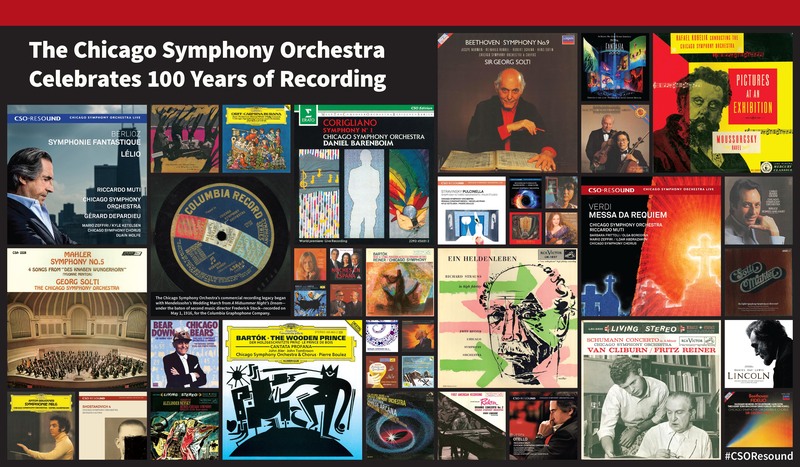 To commemorate this legacy, this collage of record and CD labels is on display in the first floor of Symphony Center’s Rotunda through the end of the Orchestra’s current—the 125th—season. Details of all of the recordings included are below (all recordings were made at Orchestra Hall unless otherwise noted). 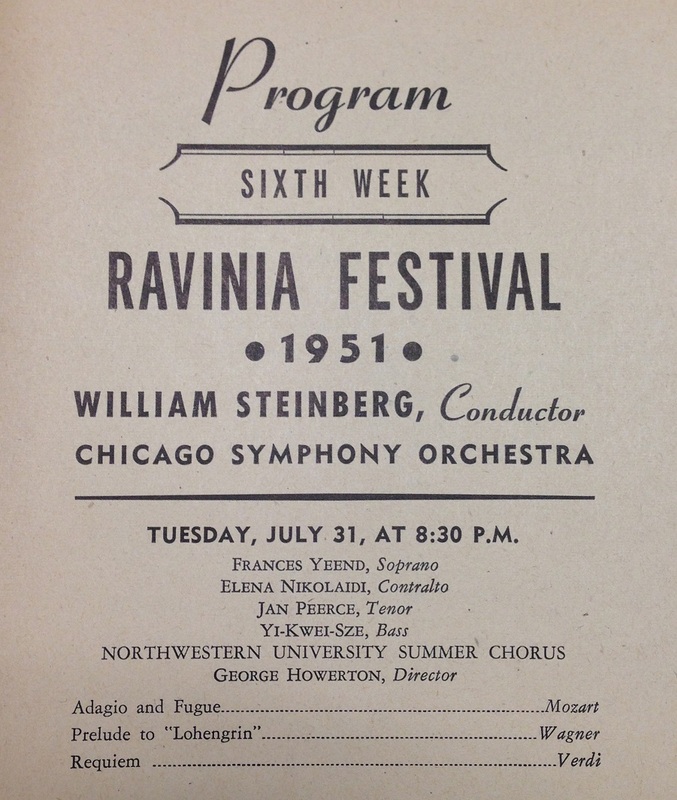 Austrian pianist Artur Schnabel made his debut with the Orchestra at the Ravinia Festival on July 11, 1942, performing Beethoven’s Fourth Piano Concerto with George Szell conducting. 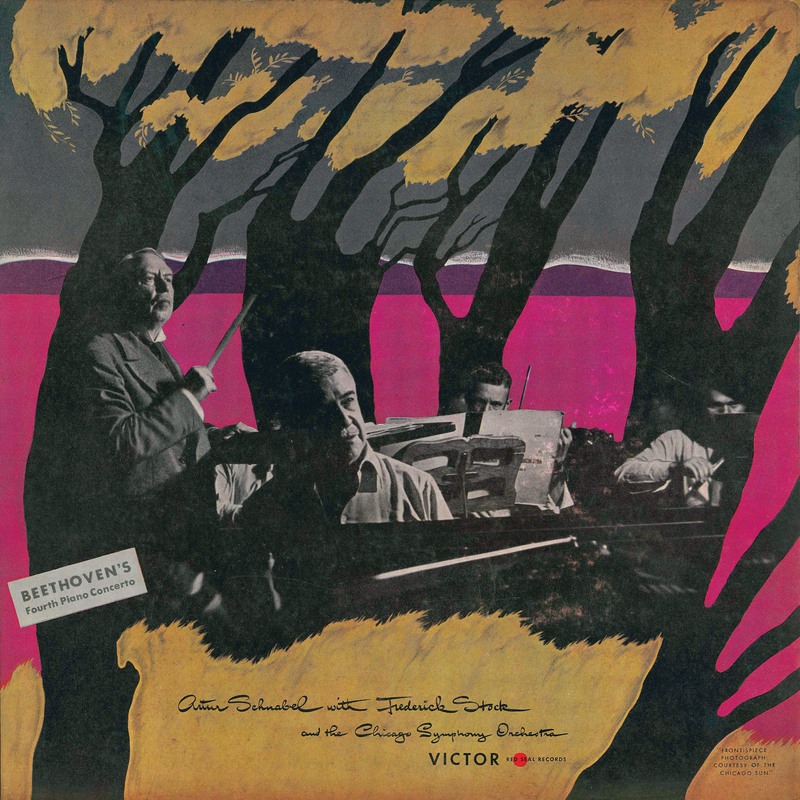 On July 22 and 24, Schnabel and the Orchestra recorded the Fourth along with Beethoven’s Fifth Piano Concerto at Orchestra Hall for Victor Records. Frederick Stock conducted these, his last, recording sessions with the Orchestra; he died a few short months later on October 20. 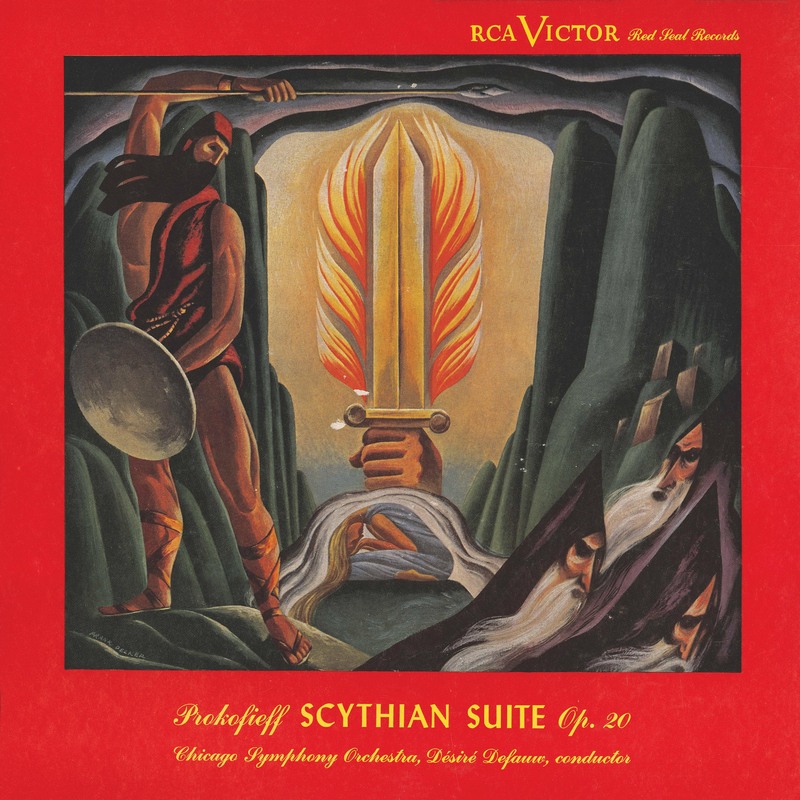 The Chicago Symphony Orchestra gave the U.S. premiere of Prokofiev’s Scythian Suite under the baton of the composer on December 6, 1918. On March 16, 1945, third music director Désiré Defauw recorded the work for RCA. 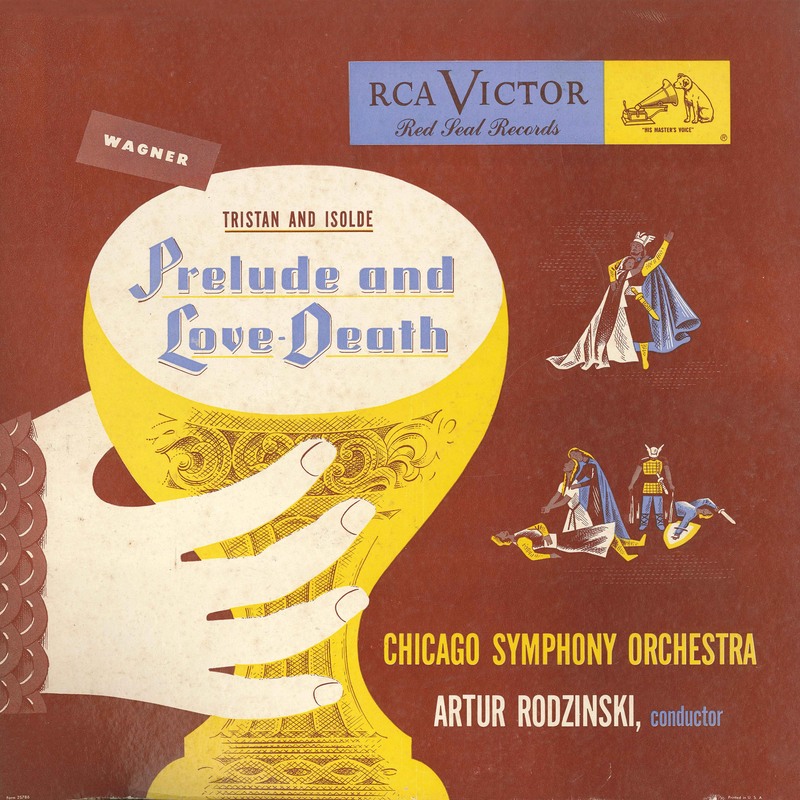 Fourth music director Artur Rodzinski led the Orchestra in a complete performance of Wagner’s Tristan and Isolde—with Set Svanholm and Kirsten Flagstad in the title roles—at the Civic Opera House on November 16, 1947. A month later on December 14, he led the Orchestra in recording sessions for the Prelude and Liebestod at Orchestra Hall. 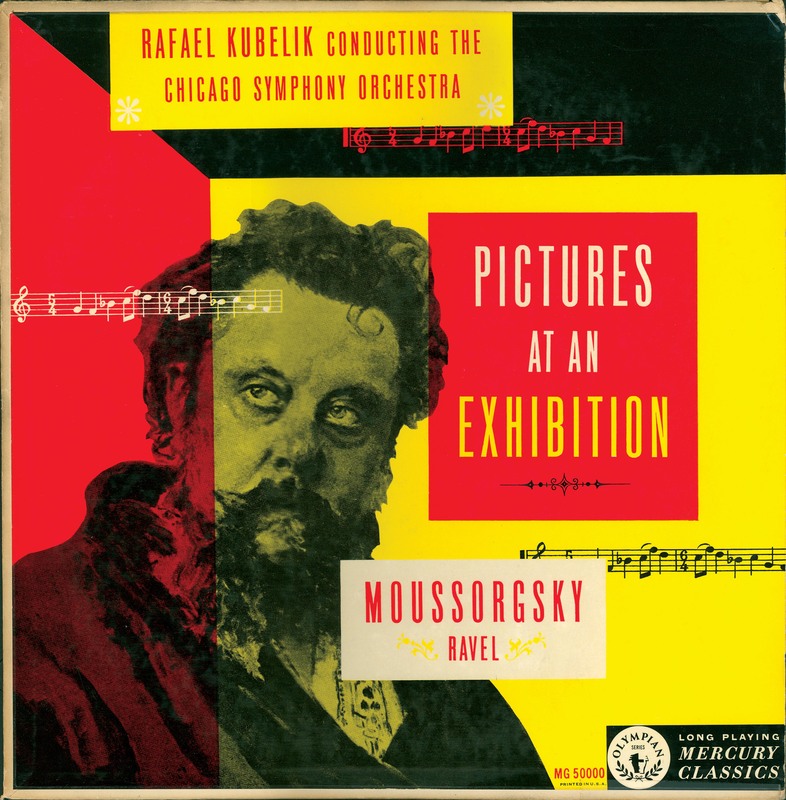 For Mercury Records, fifth music director Rafael Kubelík led the Orchestra’s first recording of Ravel’s orchestration of Mussorgsky’s Pictures at an Exhibition on April 23 and 24, 1951. Principal trumpet Adolph Herseth performed the opening fanfare. 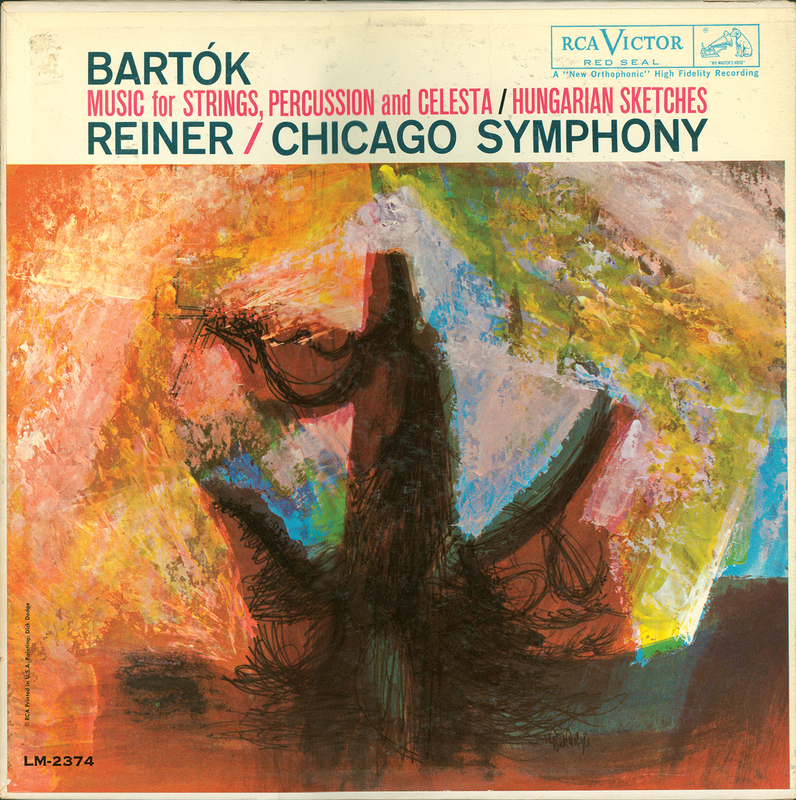 At the third annual Grammy awards ceremony on April 12, 1961, the Orchestra’s recording of Bartók’s Music for Strings, Percussion, and Celesta received the award for Best Classical Performance–Orchestra. 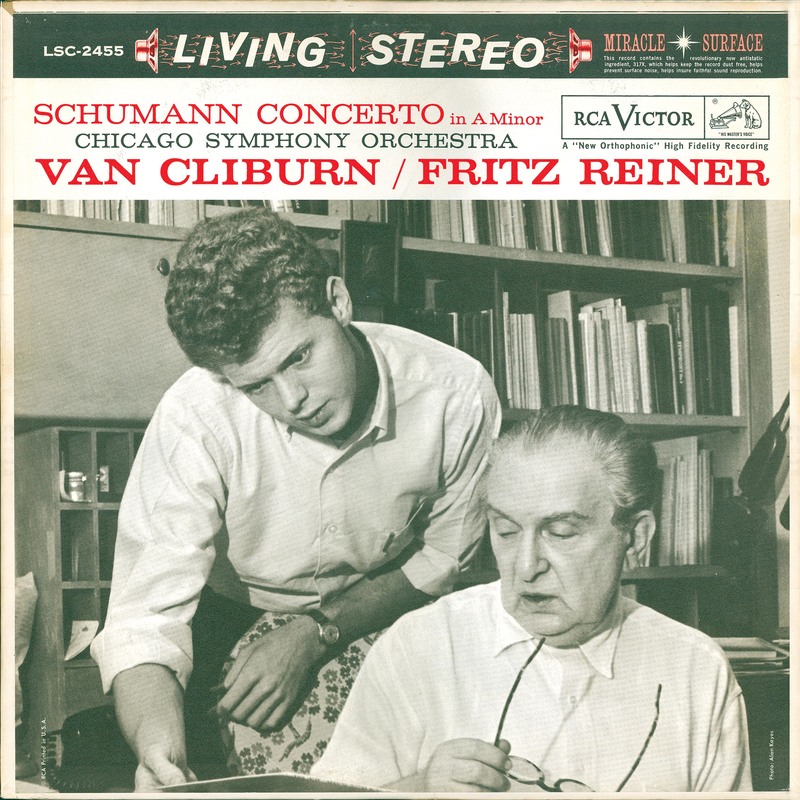 Reiner had conducted the RCA release. 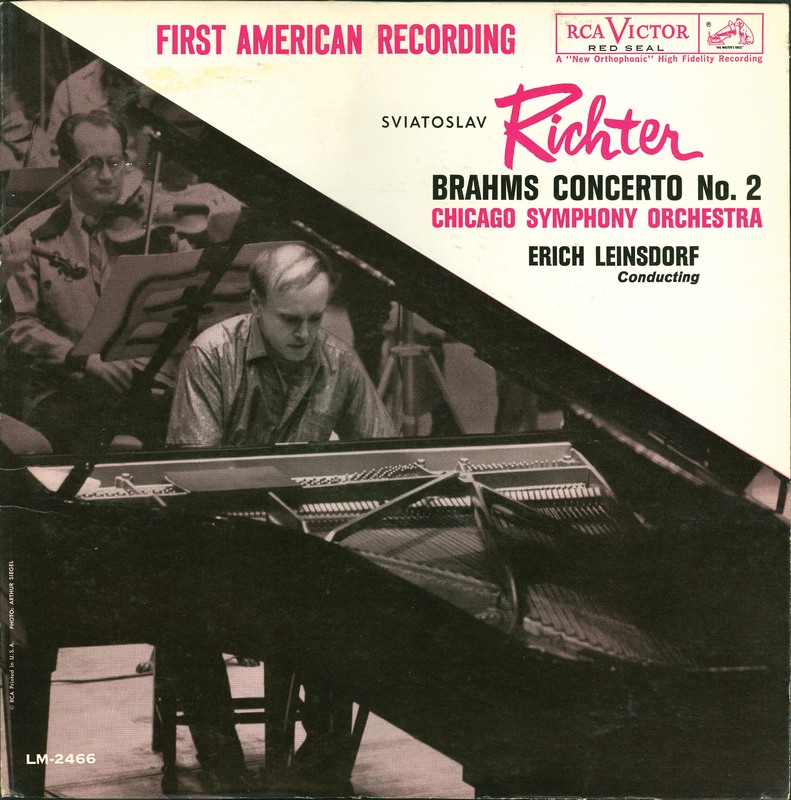 That same evening, the Orchestra’s recording of Brahms’s Second Piano Concerto—also on RCA and with Erich Leinsdorf conducting—earned the award for Best Classical Performance–Concerto or Instrumental Soloist for Sviatoslav Richter. 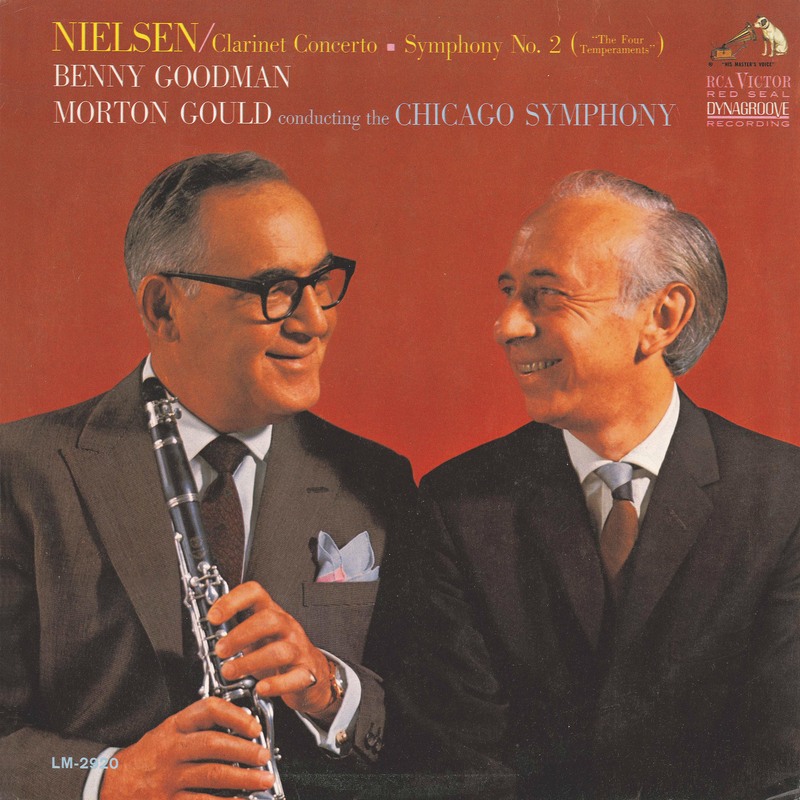 These were the first two Grammy awards earned for recordings by the Chicago Symphony Orchestra. 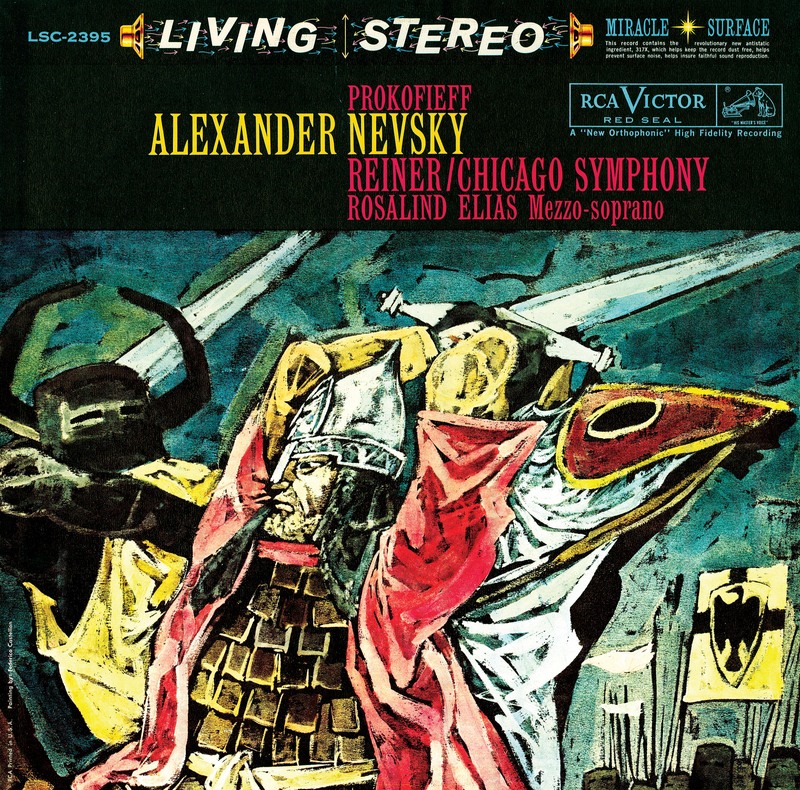 Reiner led the Orchestra, Chicago Symphony Chorus (prepared by its founder Margaret Hillis), and mezzo-soprano Rosalind Elias in Prokofiev’s Alexander Nevsky for RCA—the first recording collaboration with the Orchestra and the Chorus—on March 7, 1959, at Orchestra Hall. 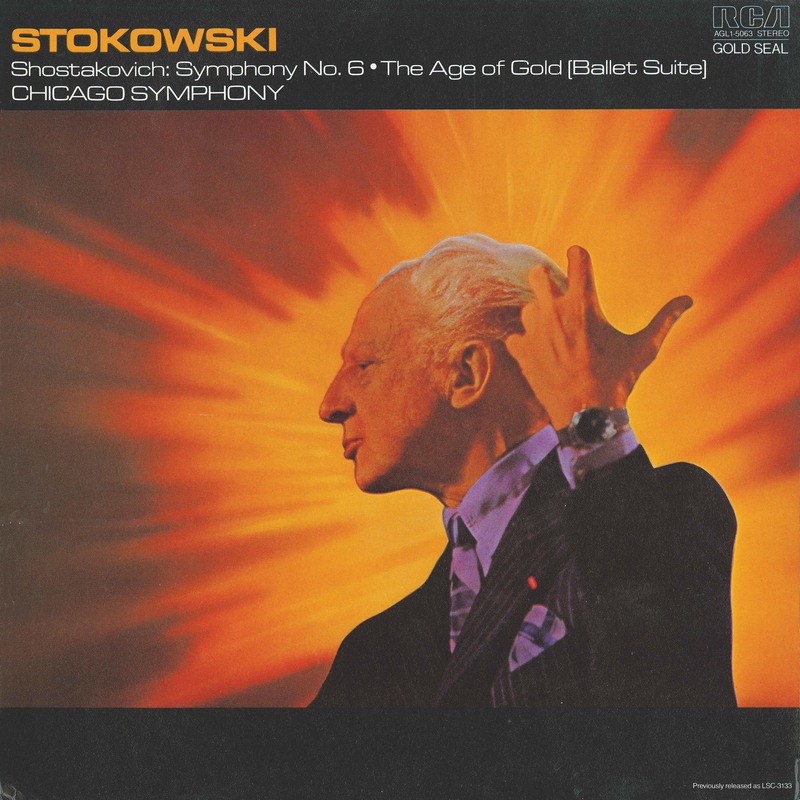 At Medinah Temple on February 20 and 21, 1968, Leopold Stokowski and the Orchestra recorded Shostakovich’s Symphony no. 6 for RCA. 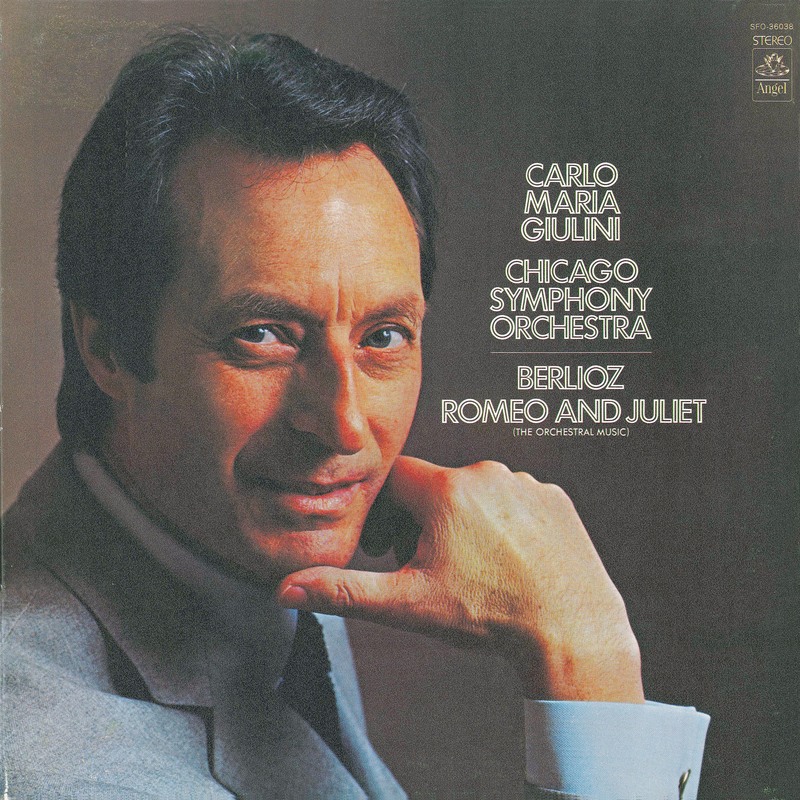 Carlo Maria Giulini—the Chicago Symphony Orchestra’s first principal guest conductor—recorded selections from Berlioz’s Romeo and Juliet for Angel on October 13 and 14, 1969, at Medinah Temple. 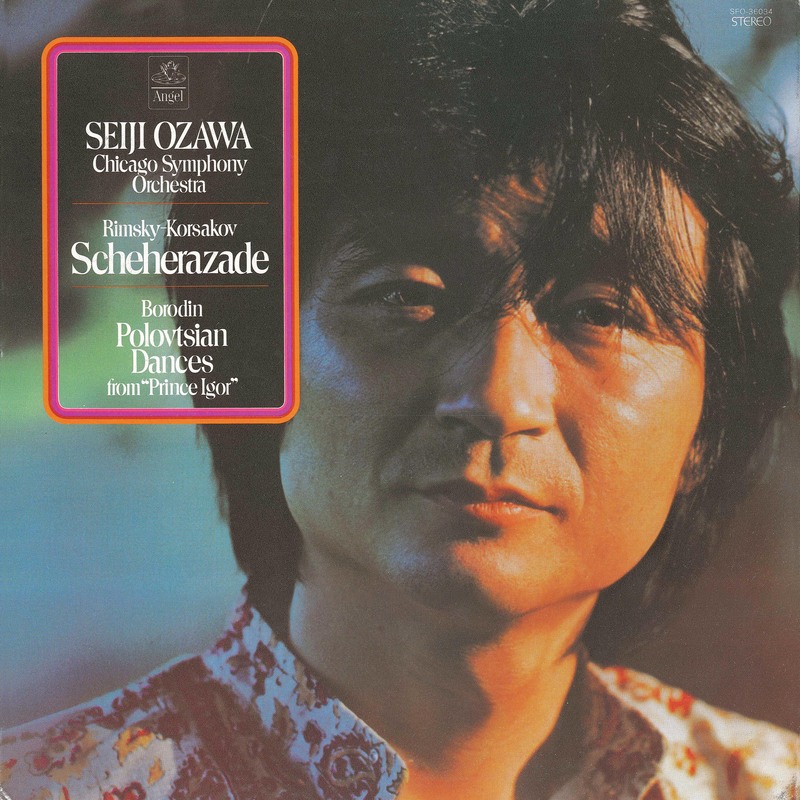 The Orchestra made its second recording of Rimsky-Korsakov’s Sheherazade on June 30 and July 1, 1969, at Medinah Temple for Angel. 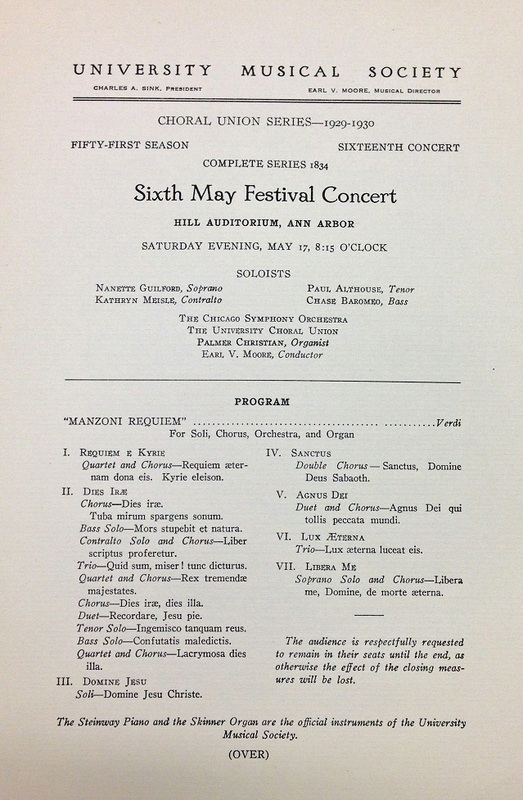 Seiji Ozawa, the Ravinia Festival’s first music director, conducted and concertmaster Victor Aitay was violin soloist. 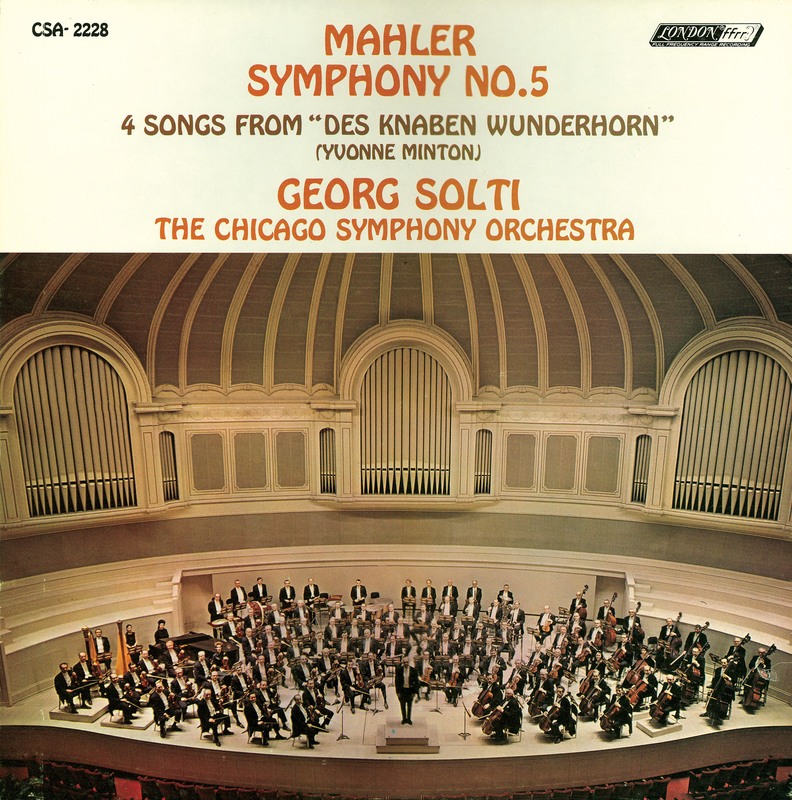 During eighth music director Georg Solti‘s first season as music director, the Orchestra performed Mahler’s Fifth Symphony at Carnegie Hall on January 9, 1970, and were called back for twelve curtain calls. 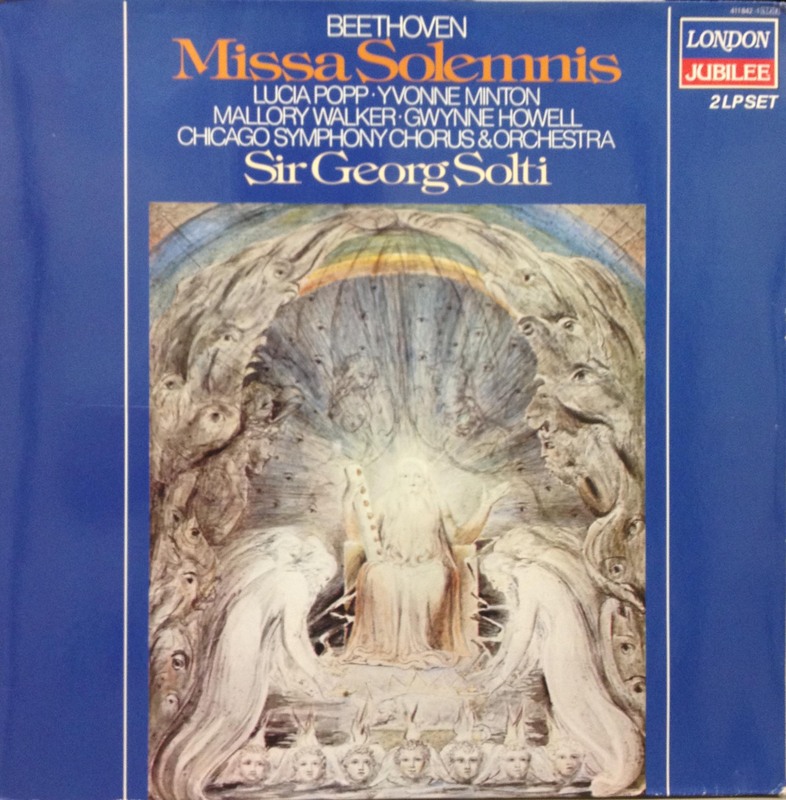 Beginning on March 26 at Medinah Temple, Solti and the Orchestra committed their performance to disc—their first recording together—for London Records. 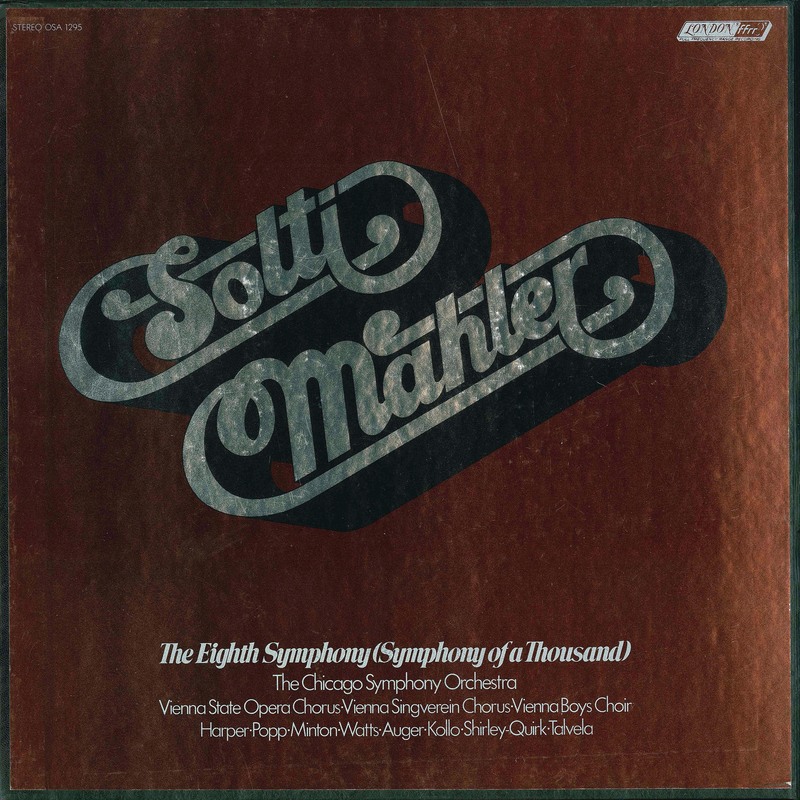 Before the Chicago Symphony Orchestra performed the first concert of its first tour to Europe in 1971, Solti led recording sessions for Mahler’s Eighth Symphony at the Sofiensaal in Vienna on August 30, 31, and September 1. Soloists included Heather Harper, Lucia Popp (more about Popp’s performances with the Orchestra is here), Arleen Augér, Yvonne Minton, Helen Watts, René Kollo, John Shirley-Quirk, and Martti Talvela. 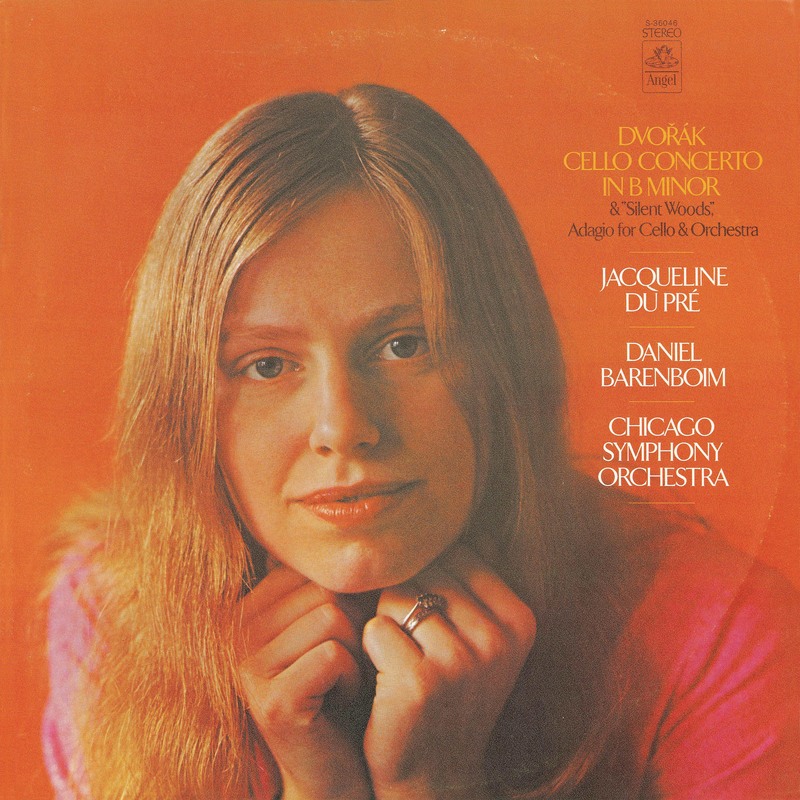 The recording won three 1972 Grammy awards for Album of the Year–Classical, Best Choral Performance–Classical (other than opera) (for the Chorus of the Vienna State Opera, Singverein Chorus, and Vienna Boys’ Choir), and Best Engineered Recording–Classical. 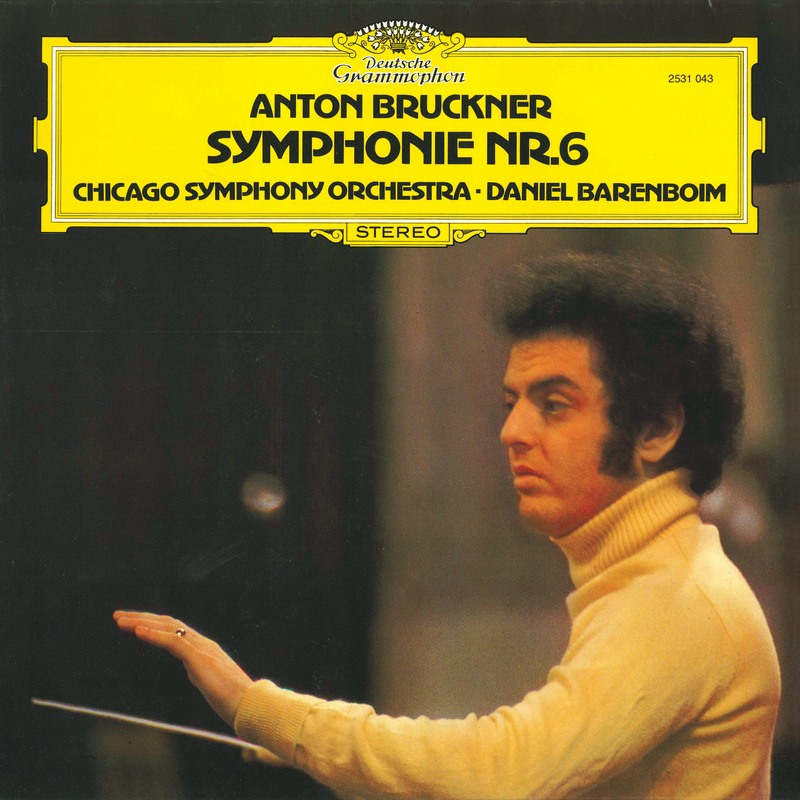 On December 13, 1977, Barenboim and the Orchestra recorded Bruckner’s Sixth Symphony for Deutsche Grammophon, part of a complete cycle of the composer’s symphonies that also included the Te Deum, Helgoland, and Psalm 150. 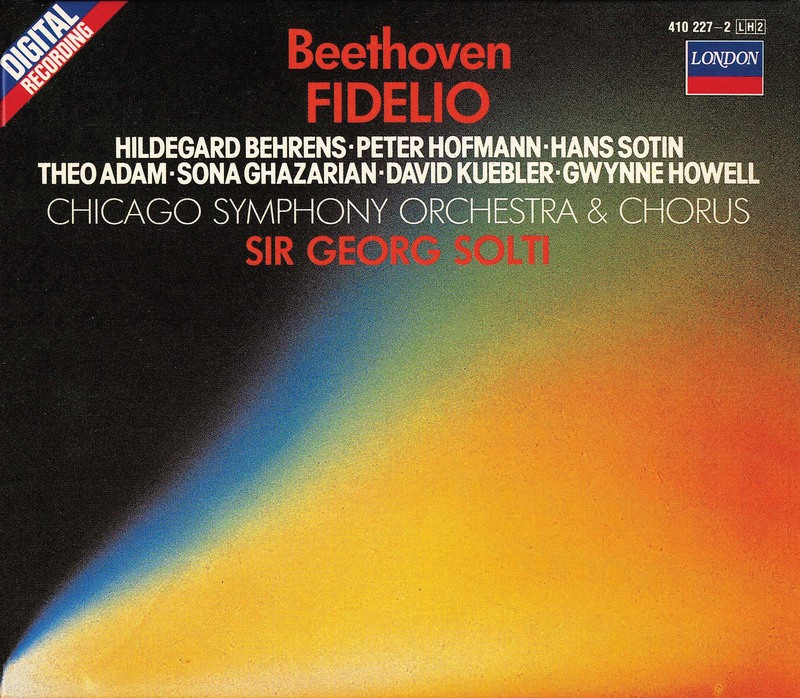 Following concerts in Orchestra Hall and Carnegie Hall, Solti led the Orchestra, Chorus, and soloists (including Hildegard Behrens as Leonore and Peter Hofmann as Florestan) and in recording sessions for Beethoven’s Fidelio—”the first digitally recorded opera to be released,” according to Gramophone—at Medinah Temple on May 21, 22, 23, and 24, 1979. 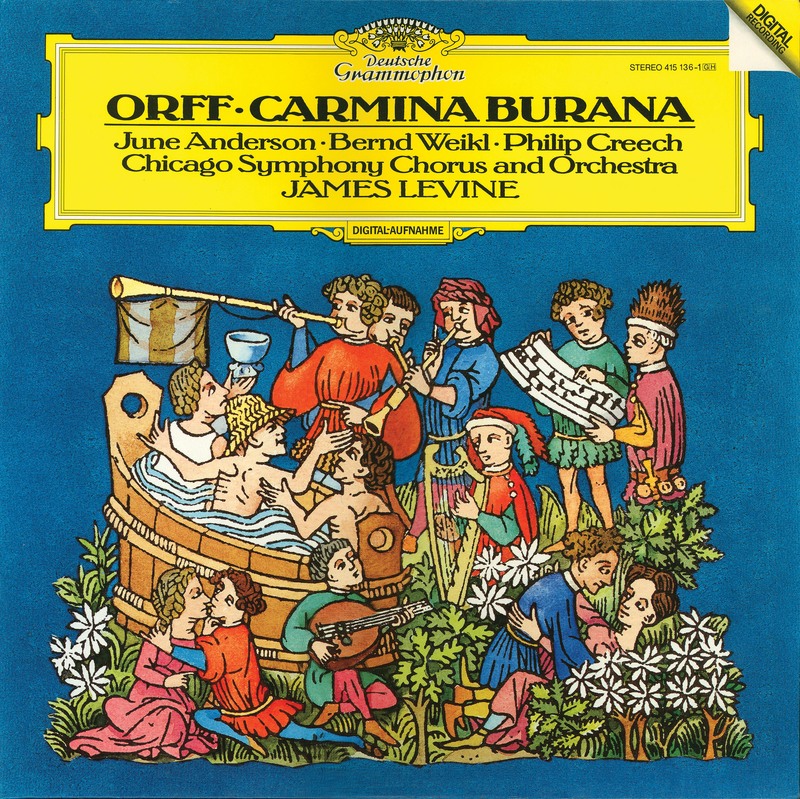 Second music director of the Ravinia Festival, James Levine led the Orchestra, Chorus, Glen Ellyn Children’s Chorus, and soloists (June Anderson, Phillip Creech, and Bernd Weikl) in sessions for Orff’s Carmina burana on July 9 and 10, 1984, for Deutsche Grammophon. 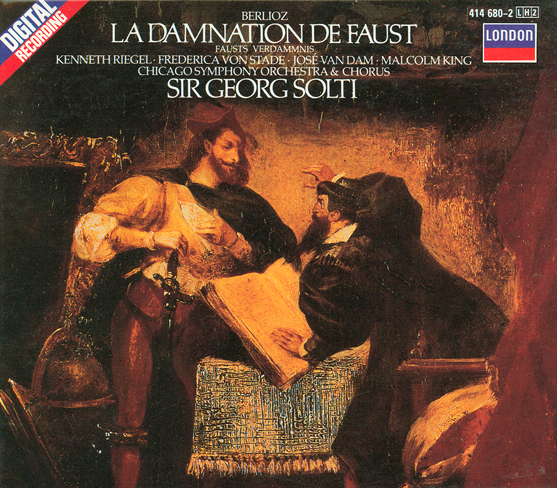 The recording was awarded the 1986 Grammy Award for Best Choral Performance (other than opera). 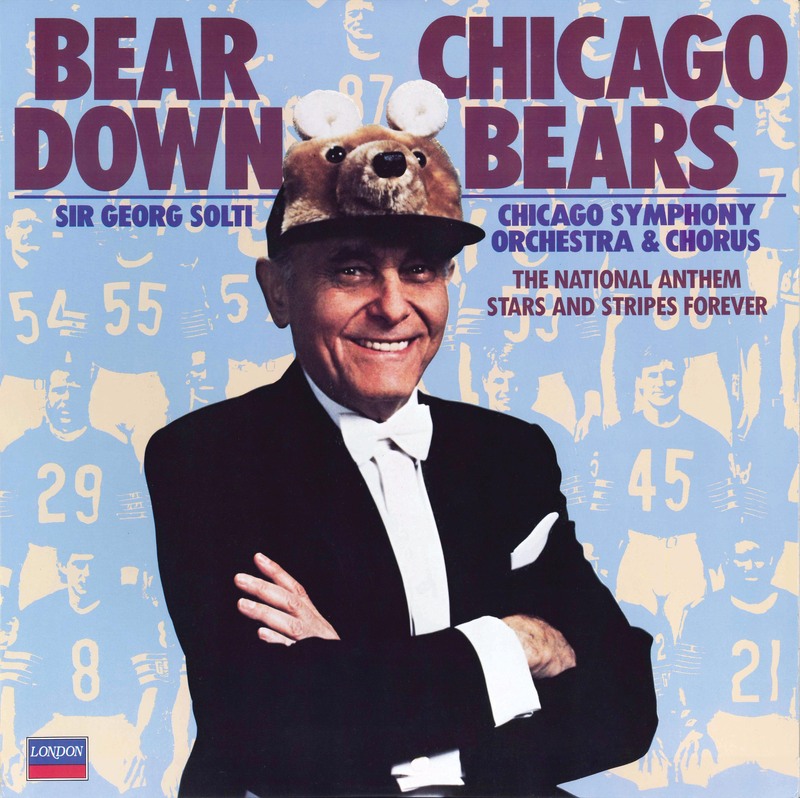 At the end of a subscription concert at Orchestra Hall on January 23, 1986, Solti led the Orchestra and Chorus in a spirited encore of the Chicago Bears‘ fight song “Bear Down, Chicago Bears” in anticipation of the team’s Super Bowl victory. The day after the game, the work was recorded by London Records. 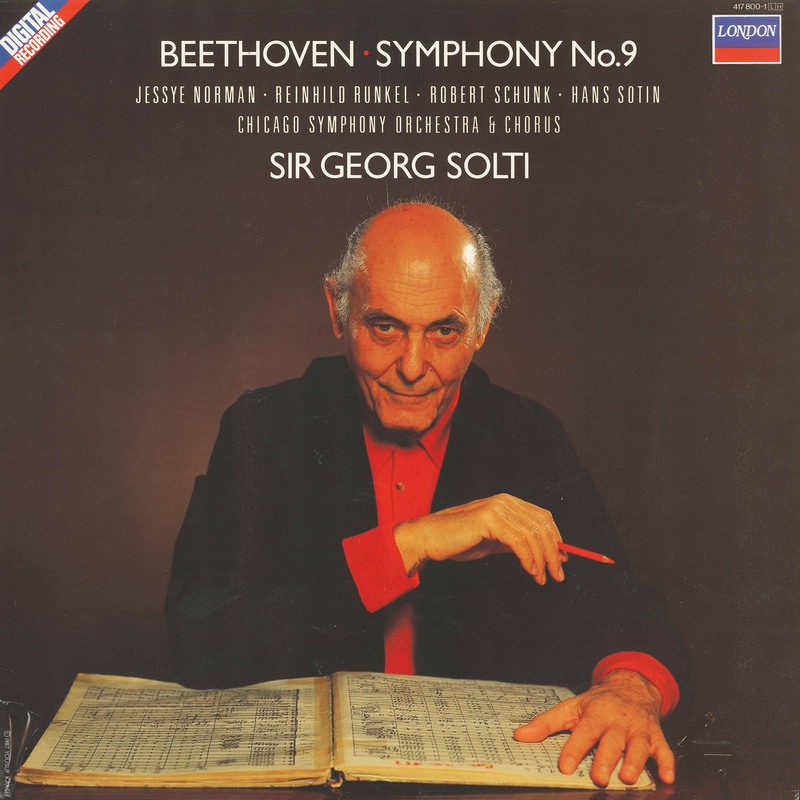 Solti led recording sessions at Medinah Temple for Beethoven’s Ninth Symphony—the second time he and the Orchestra and Chorus had recorded the work—on September 28, 30, and October 7, 1986, for London. Soloists were Jessye Norman, Reinhild Runkel, Robert Schunk, and Hans Sotin. The release was awarded the 1987 Grammy Award for Best Orchestral Performance. 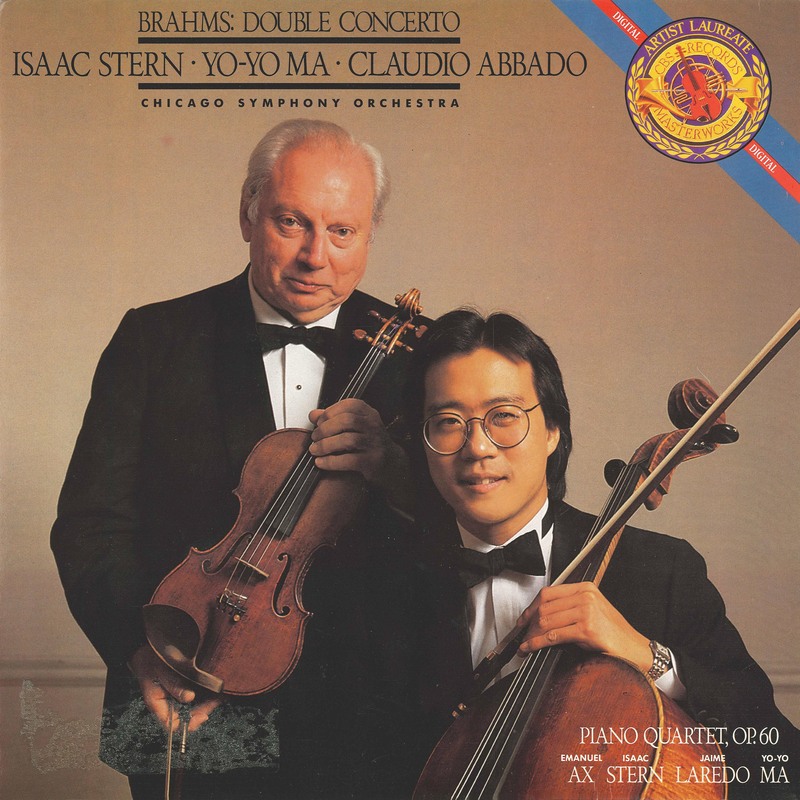 Claudio Abbado, second principal guest conductor, led the Orchestra in Brahms’s Double Concerto with Isaac Stern and Yo-Yo Ma (future Judson and Joyce Green Creative Consultant) as soloists on November 7 and 8, 1986, for CBS Records. 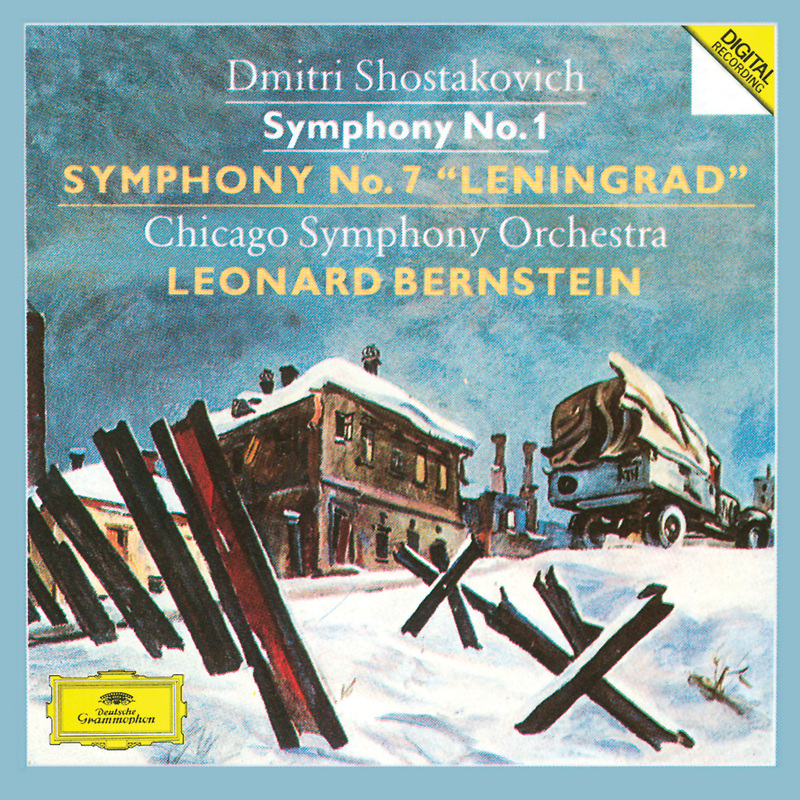 Closing the 97th season in June 1988, Leonard Bernstein led the Orchestra in performances of Shostakovich’s First and Seventh symphonies. 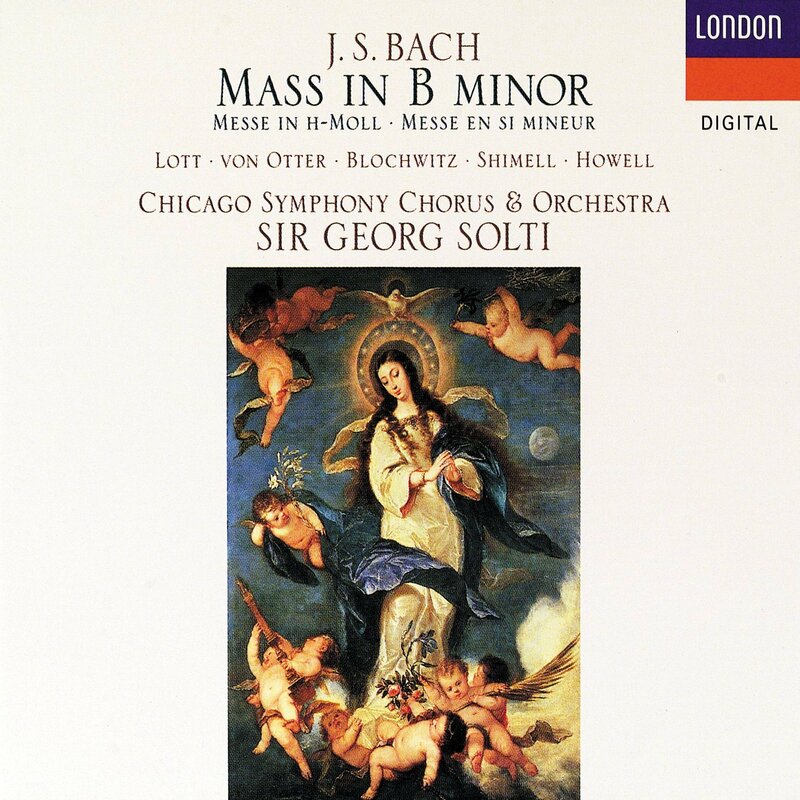 Recorded live by Deutsche Grammophon, the release received the 1990 Grammy Award for Best Orchestral Performance. On March 15, 16, and 17, 1990, Barenboim led the world premiere performances of composer-in-residence John Corigliano’s Symphony no. 1, commissioned for the Orchestra. The live recording—Barenboim and the Orchestra’s first on the Erato label—was awarded two 1991 Grammy awards for Best Orchestral Performance and Best Contemporary Composition. 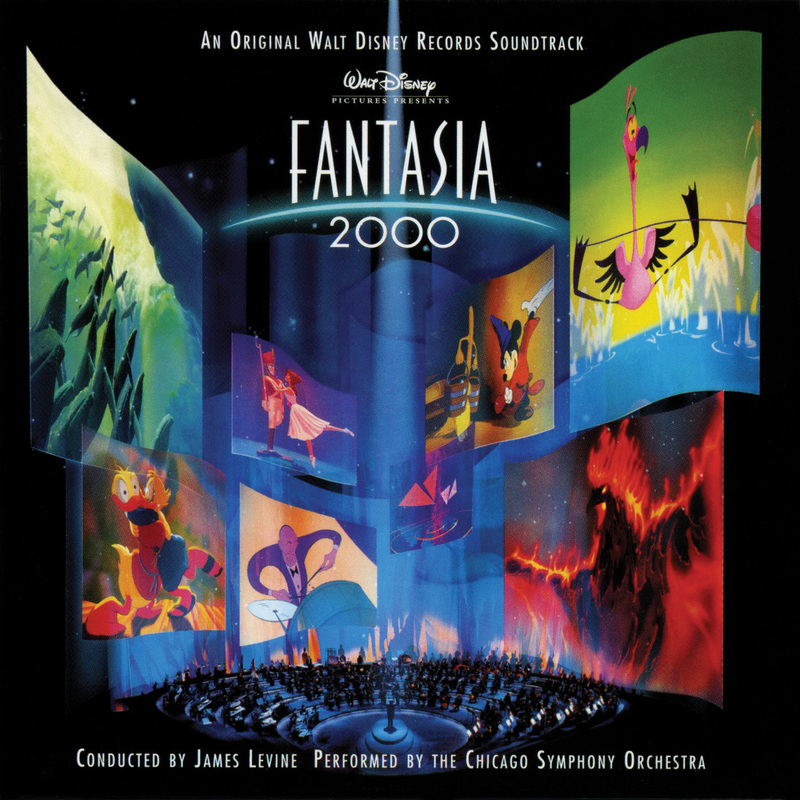 Between 1993 and 1996, Levine led the Orchestra and Chorus in recording sessions at Medinah Temple for Disney‘s feature film Fantasia 2000. The movie was released on January 1, 2000. 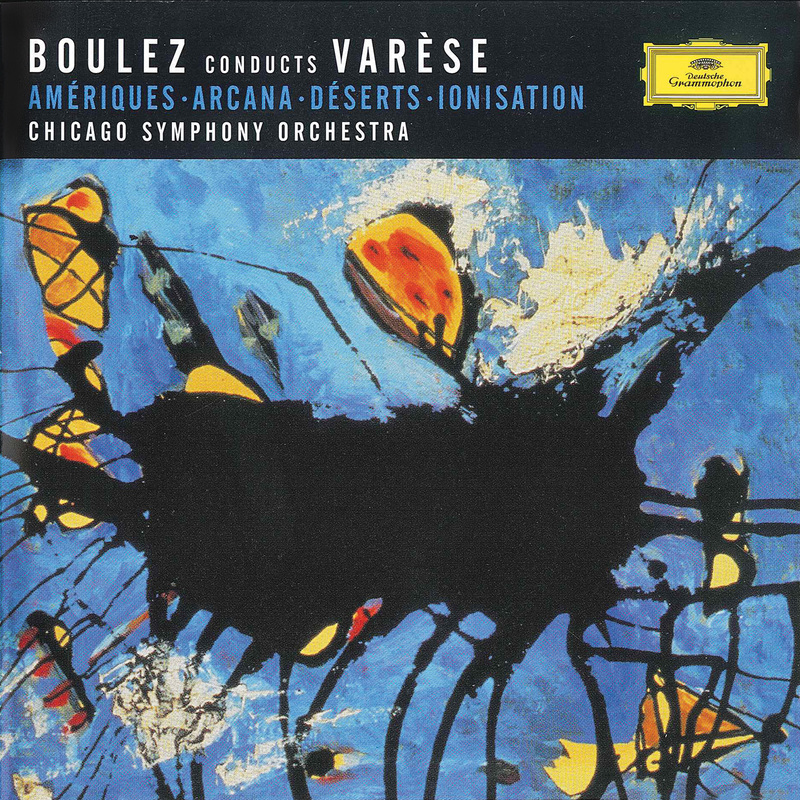 Shortly after being named the Orchestra’s third principal guest conductor, Boulez led sessions for Varèse’s Amériques, Arcana, Déserts, and Ionisation in December 1995 and 1996. The Deutsche Grammophon release was awarded the 2001 Grammy Award for Best Orchestral Performance. In May 1997 at Medinah Temple, the Orchestra recorded Falla’s Nights in the Gardens of Spain and The Three-Cornered Hat for Teldec. 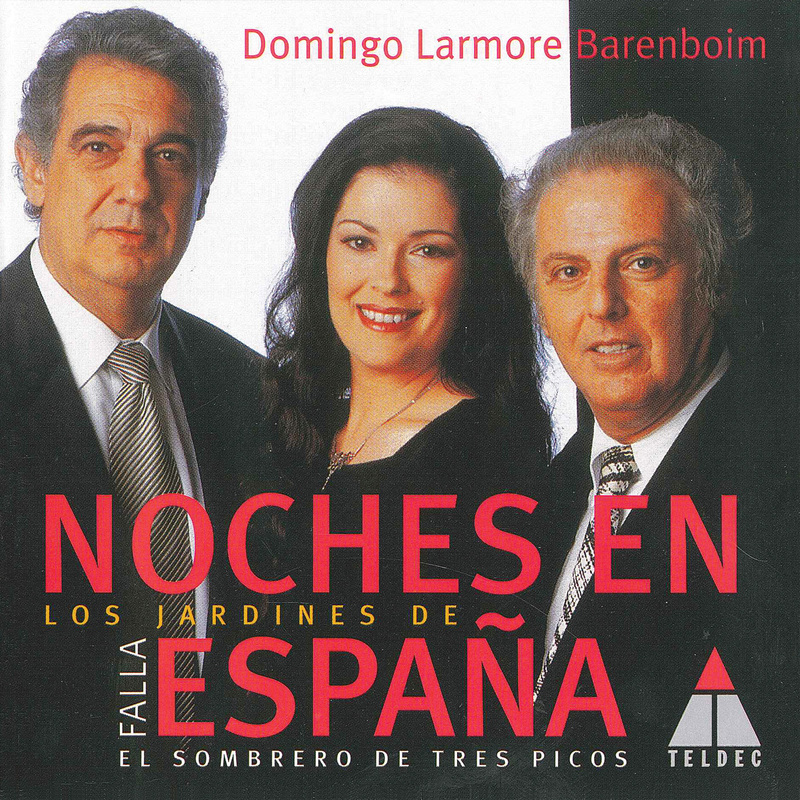 For Nights in the Gardens of Spain, Barenboim was piano soloist and Plácido Domingo conducted; for The Three-Cornered Hat, Jennifer Larmore was mezzo-soprano soloist and Barenboim conducted. 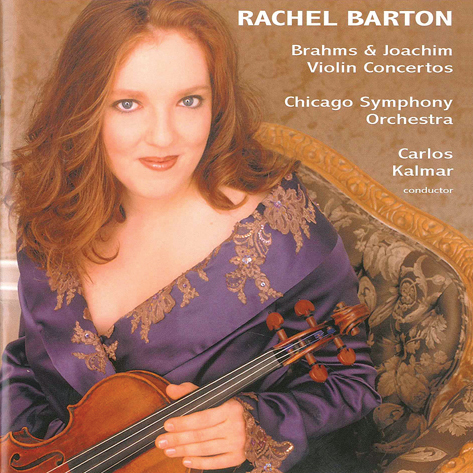 A former Youth Auditions winner and member of the Civic Orchestra of Chicago, Rachel Barton recorded Brahms’s and Joachim’s violin concertos for Cedille Records on July 2 and 3, 2002. Carlos Kalmar conducted. In his first concerts as principal conductor on October 19, 20, and 21, 2006, Bernard Haitink led the Orchestra, women of the Chorus (prepared by Duain Wolfe), the Chicago Children’s Choir, and mezzo-soprano Michelle DeYoung in Mahler’s Third Symphony. 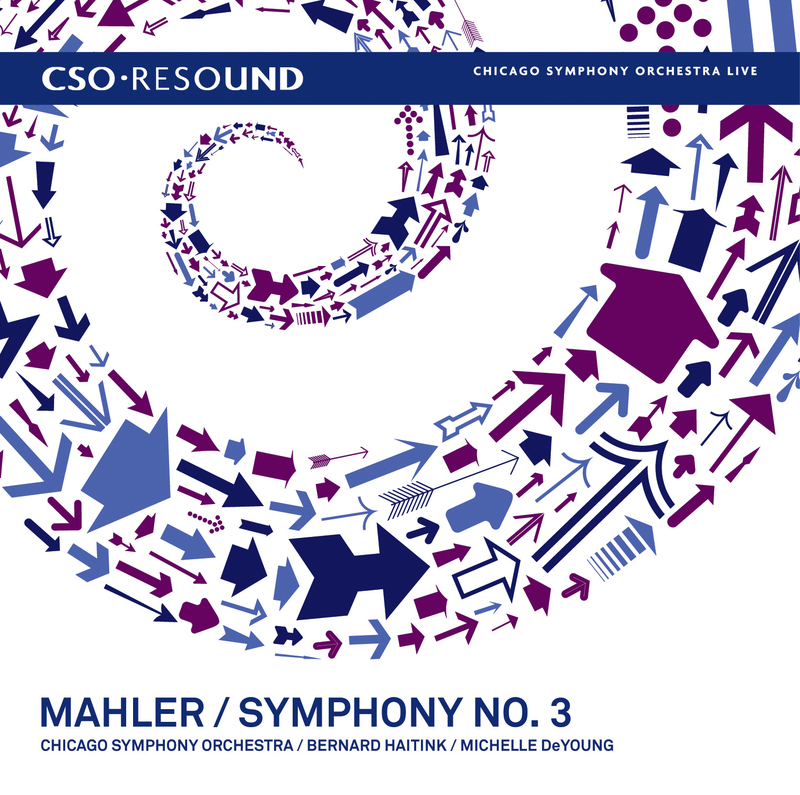 The work is recorded as the inaugural release on CSO Resound. 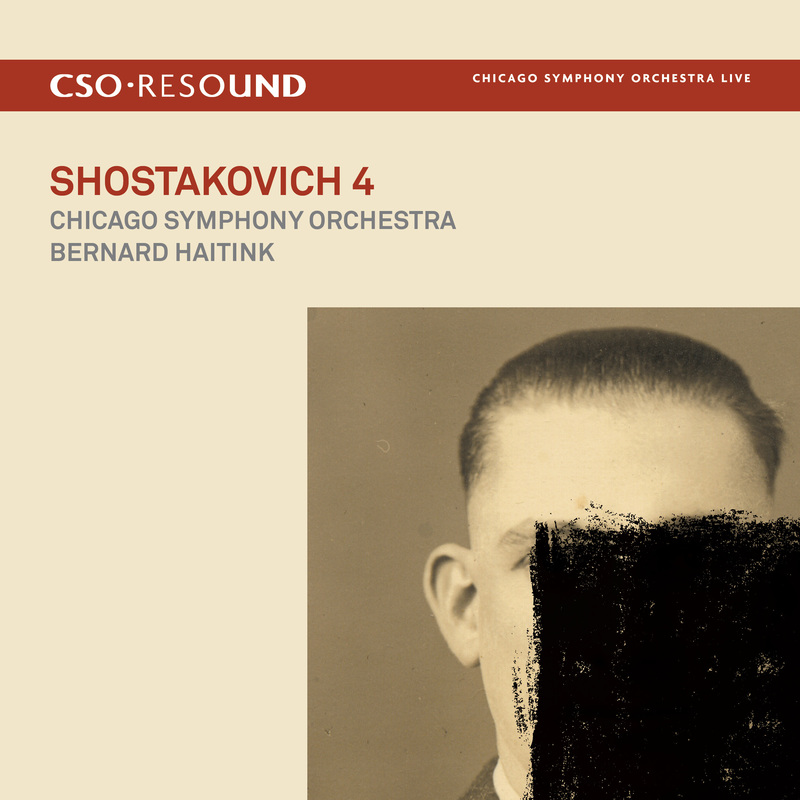 In May 2008, Haitink and the Orchestra recorded Shostakovich’s Fourth Symphony for CSO Resound. The release was awarded the 2008 Grammy Award for Best Orchestral Performance. 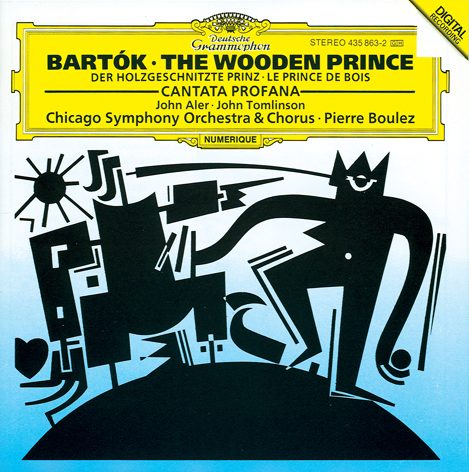 Boulez led the Orchestra in Stravinsky’s Pulcinella, Symphony in Three Movements, and Four Studies in February and March 2009 for CSO Resound. Soloists in the Pulcinella were Roxana Constantinescu, Nicholas Phan, and Kyle Ketelsen. 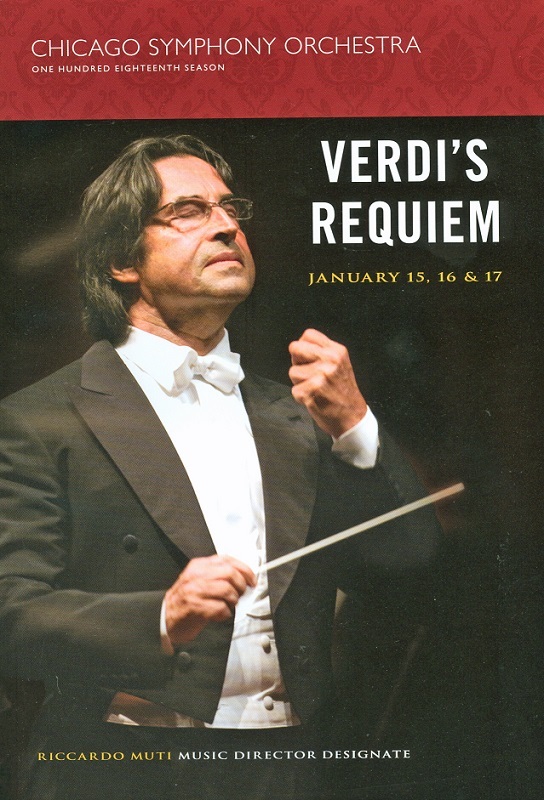 On January 15, 16, and 17, 2009, Riccardo Muti—in his first concerts as music director designate—led the Orchestra, Chorus, and soloists (Barbara Frittoli, Olga Borodina, Mario Zeffiri, and Ildar Abdrazakov) in Verdi’s Requiem. The subsequent CSO Resound recording was awarded 2010 Grammy awards for Best Classical Album and Best Choral Performance. 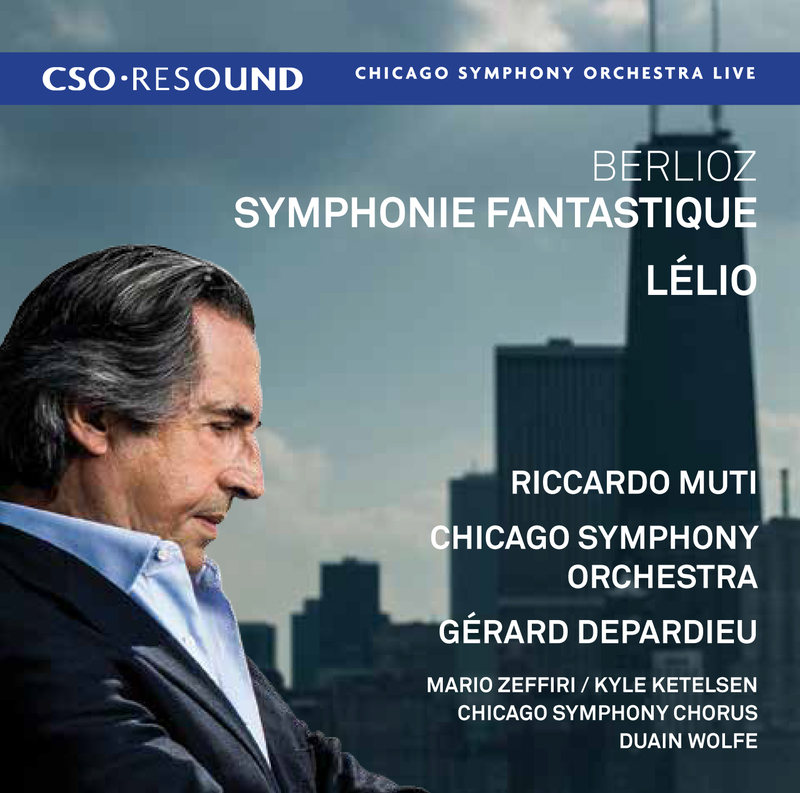 Following his first concert as the Chicago Symphony Orchestra’s tenth music director (for more than 25,000 people in Millennium Park) in September 2010, Muti led the Orchestra, Chorus, and soloists (Gérard Depardieu, Mario Zeffiri, and Kyle Ketelsen) in Berlioz’s Symphonie fantastique and Lélio. 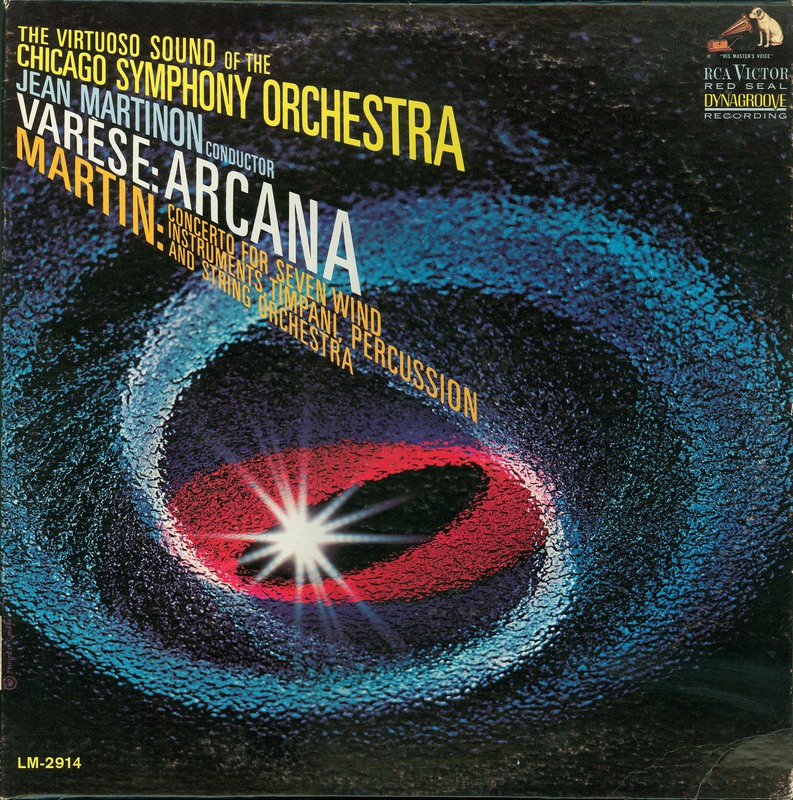 The two-disc set was released on CSO Resound in September 2015. 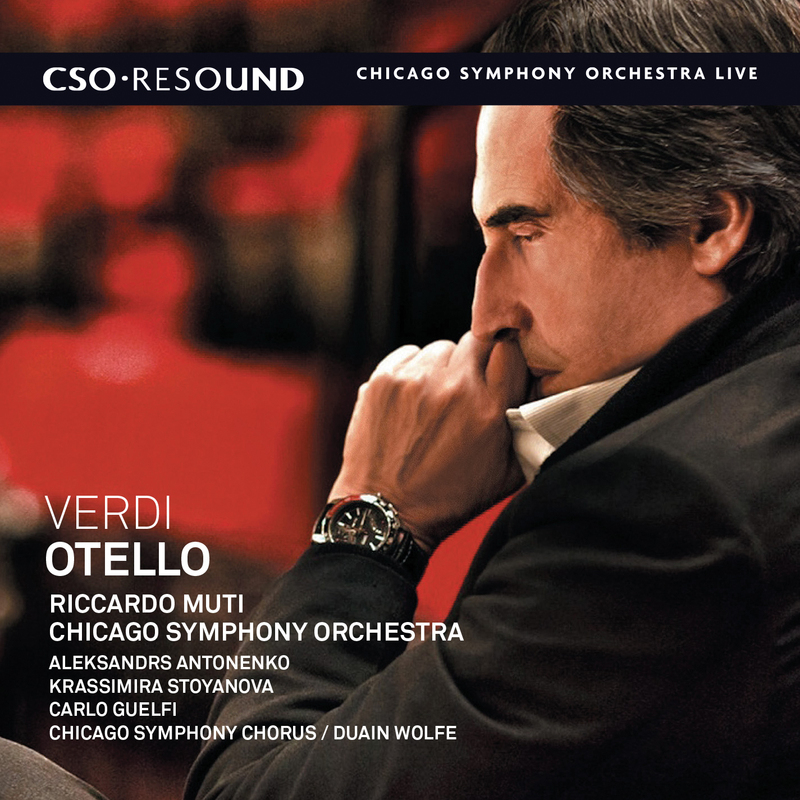 On April 7, 9, and 12, 2011, Muti led concert performances—recorded by CSO Resound—of Verdi’s Otello at Orchestra Hall. Along with the Orchestra, Chorus, and Chicago Children’s Chorus, soloists included Aleksandrs Antonenko in the title role, Krassimira Stoyanova as Desdemona, and Carlo Guelfi as Iago. In February 2012, Muti led world premieres by the Orchestra’s Mead Composers-in-Residence: Anna Clyne’s Night Ferry and Mason Bates’s Alternative Energy. Both works were recorded for CSO Resound and released as digital downloads. 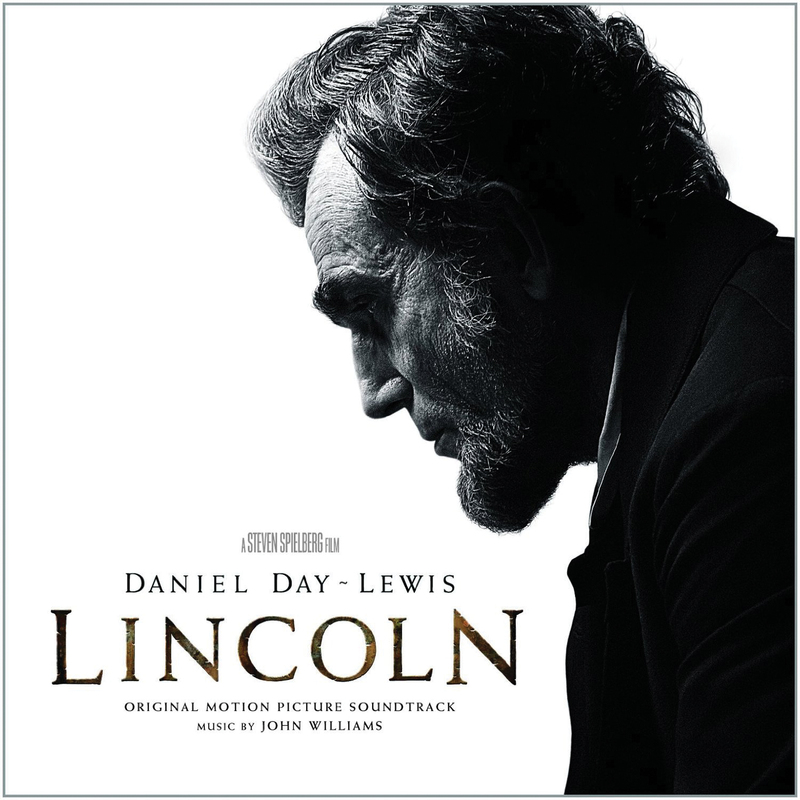 For Sony Classical, composer John Williams led the Orchestra and Chorus in recording sessions at Orchestra Hall for his soundtrack for the motion picture Lincoln. Director Steven Spielberg was on hand to supervise. Cheers to the next 100! As we count down the days to Giuseppe Verdi‘s 200th birthday and our performance and simulcast of his Requiem led by Riccardo Muti, here are all of the recordings of the work by the Chicago Symphony Orchestra and Chorus. 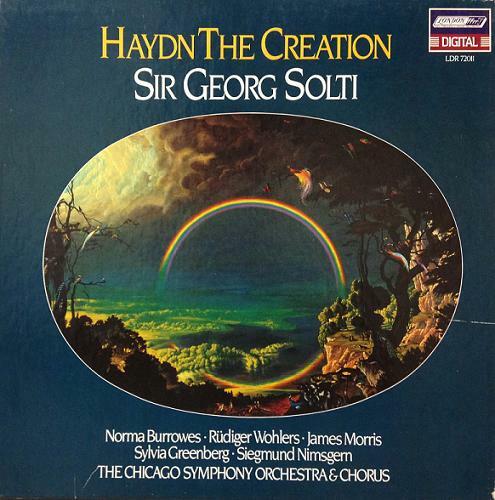 Our eighth music director, Sir Georg Solti, was the first to commercially record Verdi’s Requiem. The work was recorded in Medinah Temple on June 1 and 2, 1977. 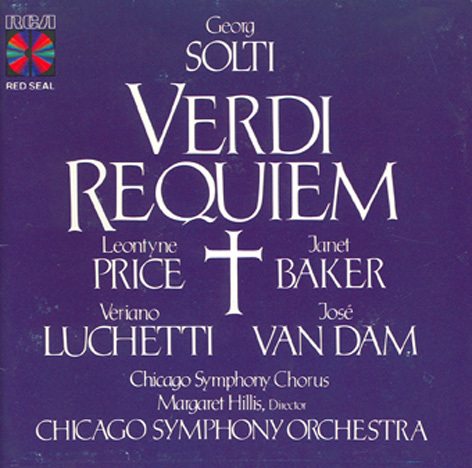 The soloists were Leontyne Price, soprano; Janet Baker, mezzo-soprano; Veriano Luchetti, tenor; and José van Dam, bass-baritone. 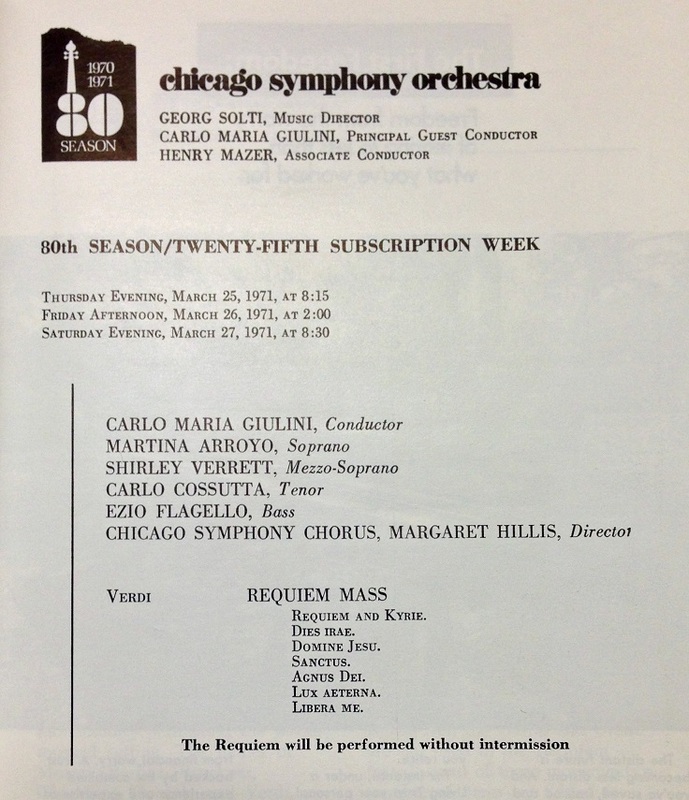 The Chicago Symphony Chorus was prepared by Margaret Hillis. 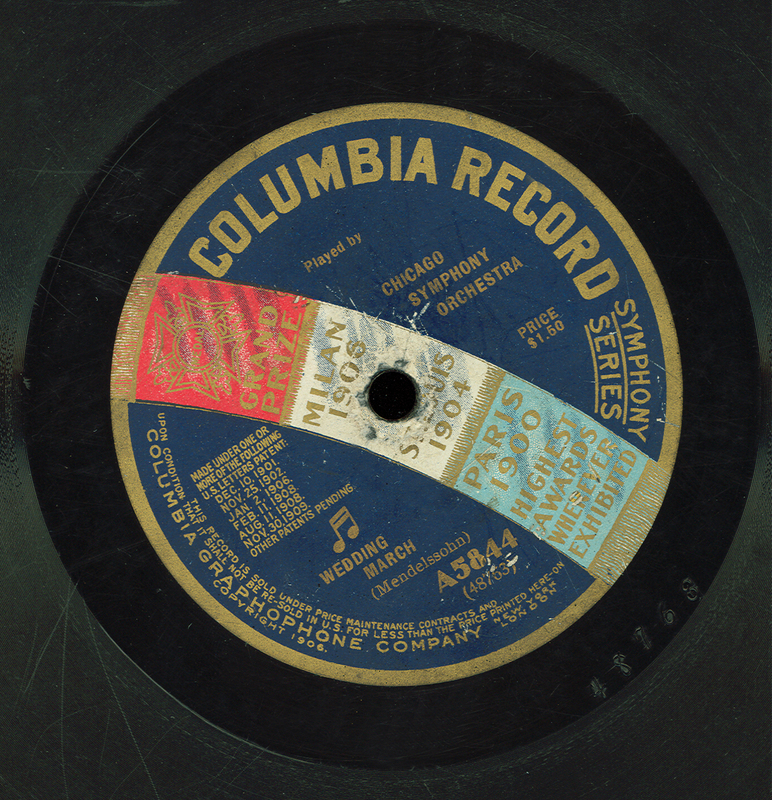 Thomas Z. Shepard produced the recording, and Paul Goodman was the engineer for RCA (this was one of the few records Solti made independent of London/Decca). The recording won the 1977 Grammy Award for Best Choral Performance (other than opera) from the National Academy of Recording Arts and Sciences. 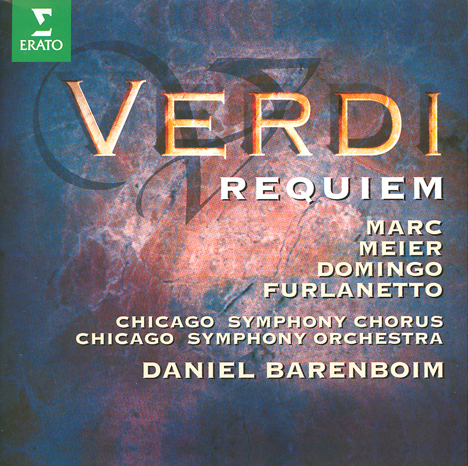 Ninth music director Daniel Barenboim led recording sessions for Verdi’s Requiem on September 20 and 21, 1993, in Orchestra Hall. Soloists included Alessandra Marc, soprano; Waltraud Meier, mezzo-soprano; Plácido Domingo, tenor; and Ferruccio Furlanetto, bass. 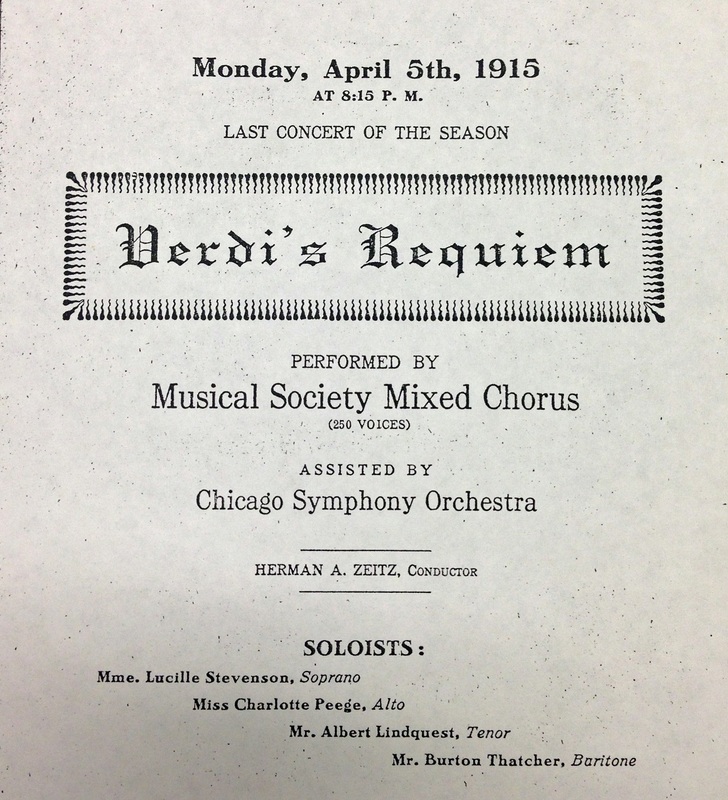 The Chicago Symphony Chorus was prepared by Margaret Hillis. Martin Sauer produced the recording; Jean Chatauret was the sound engineer, assisted by Christopher Willis; and Martine Guers was the editor for Erato. 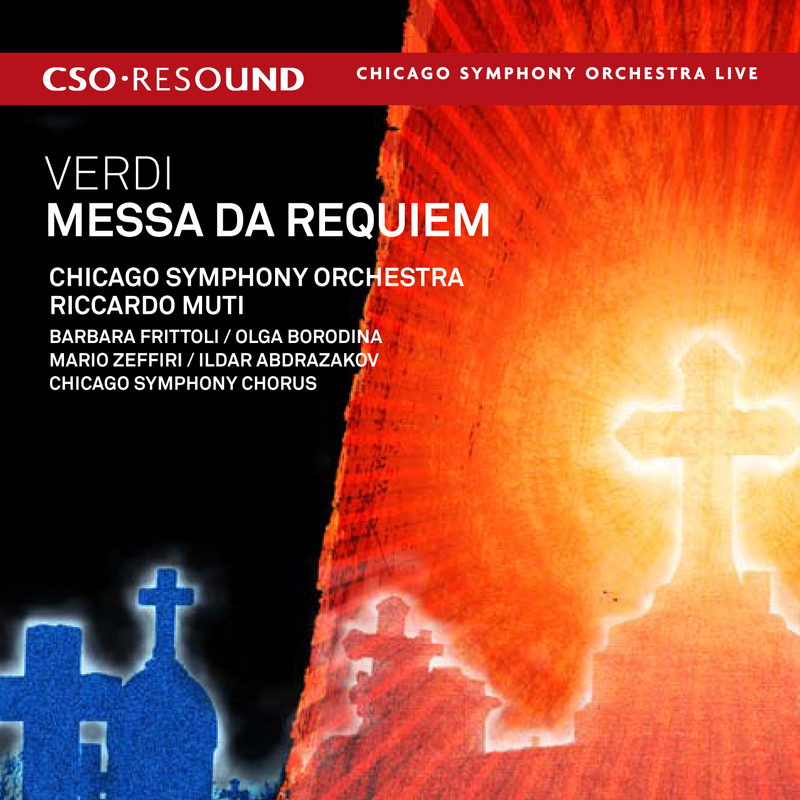 In his first concerts at the CSO’s music director designate, Riccardo Muti led performances of Verdi’s Requiem at Orchestra Hall on January 15, 16, and 17, 2009. 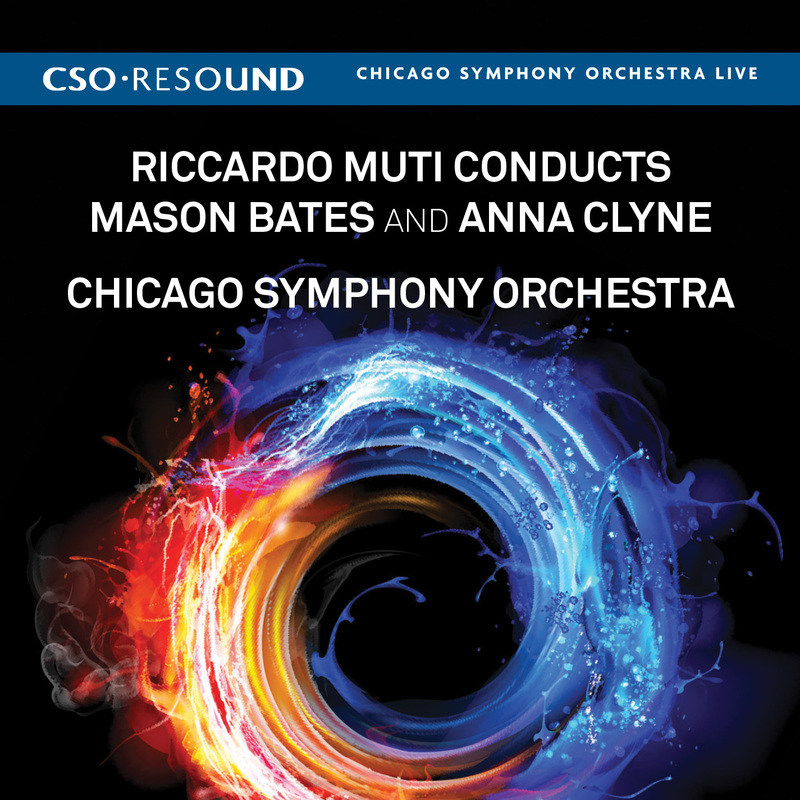 The performances were recorded live for CSO Resound. The soloists were Barbara Frittoli, soprano; Olga Borodina, mezzo-soprano; Mario Zeffiri, tenor; and Ildar Abdrazakov, bass. 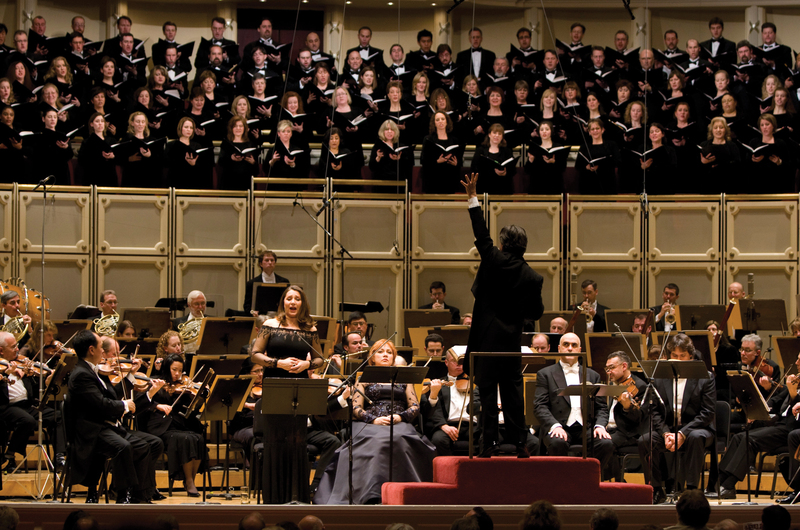 The Chicago Symphony Chorus was prepared by Duain Wolfe. Christopher Adler produced the recording, and Christopher Willis was the recording engineer. David Frost and Tom Lazarus did the mixing, and Frost and Silas Brown performed the stereo mastering. The recording won 2010 Grammy Awards for Best Classical Album and Best Choral Performance from the National Academy of Recording Arts and Sciences. But wait, there’s more . 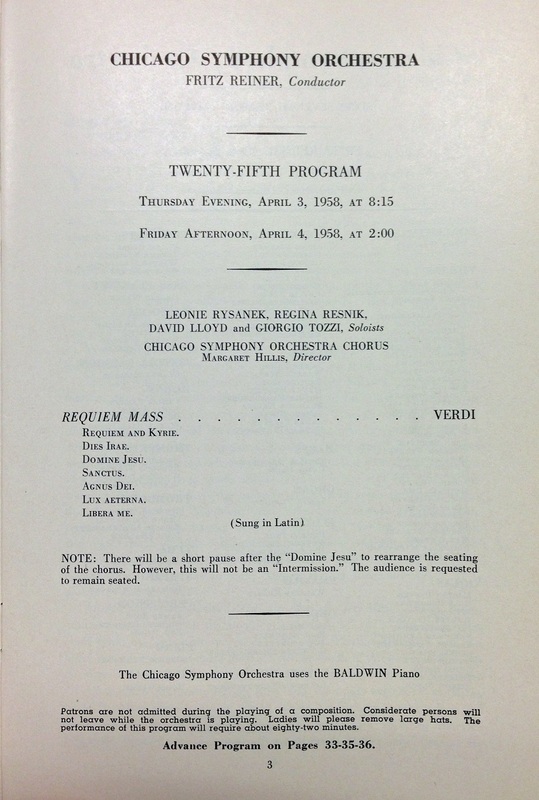 . .
Fritz Reiner, the CSO’s sixth music director, led performances of the Requiem at Orchestra Hall on April 3 and 4, 1958. Soloists included Leonie Rysanek, soprano; Regina Resnik, mezzo-soprano; David Lloyd, tenor; and Giorgio Tozzi, bass. 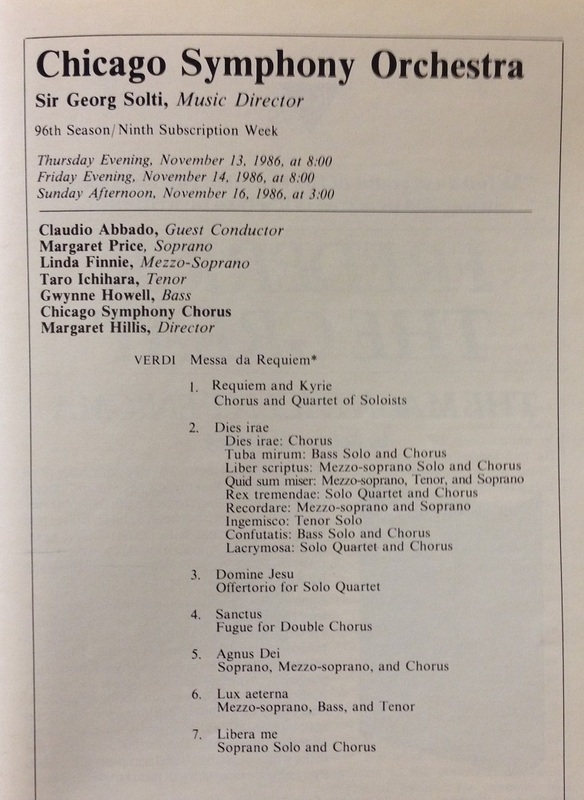 The Chicago Symphony Chorus—in their second subscription concert appearances—was prepared by Margaret Hillis. The March 4 performance was recorded for radio broadcast and since then, it has surfaced on a variety of unauthorized releases. 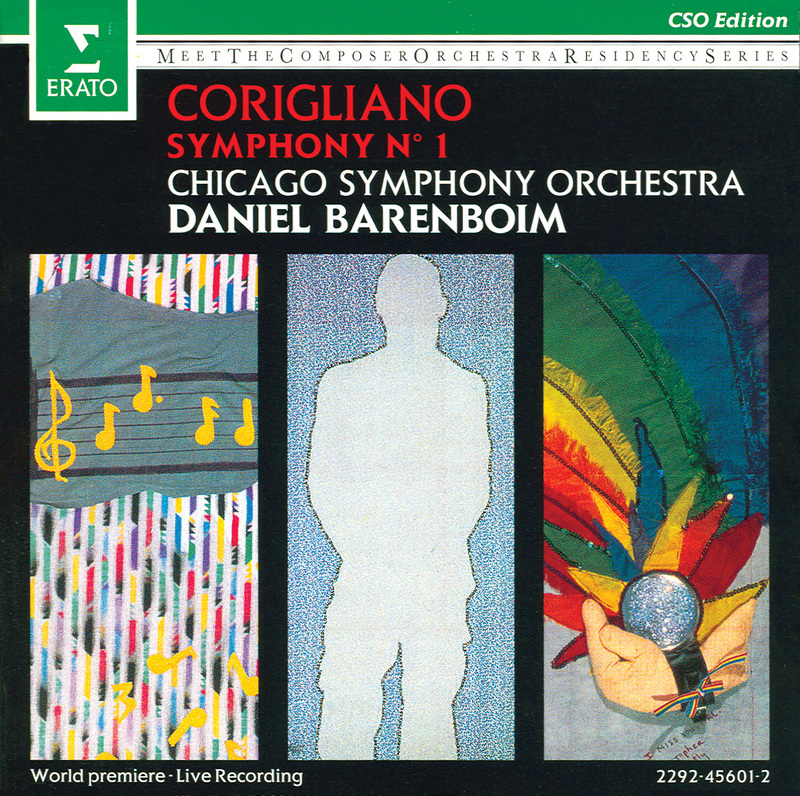 An Italian release on Melodram in 1986 even mistakenly labeled the LP jacket as “Orchestra e Coro: Chicago Lyric Opera.” Most recently, we have seen it on a CD release from Archipel. 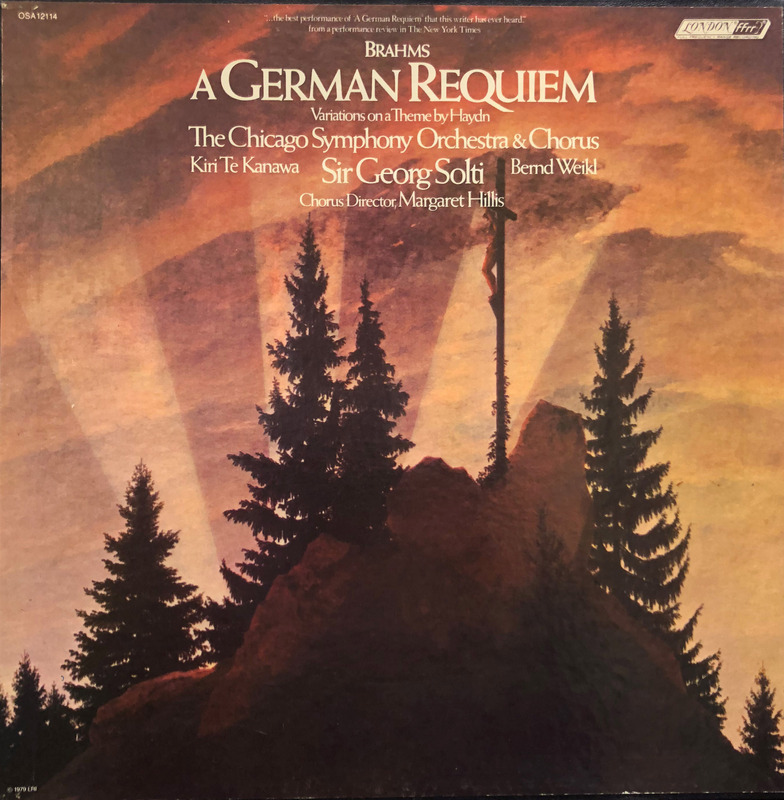 Unfortunately, the sound quality on both is not great, even though it does provide an interesting snapshot of Reiner’s interpretation of the work, not to mention the sound of a very young Chicago Symphony Chorus.